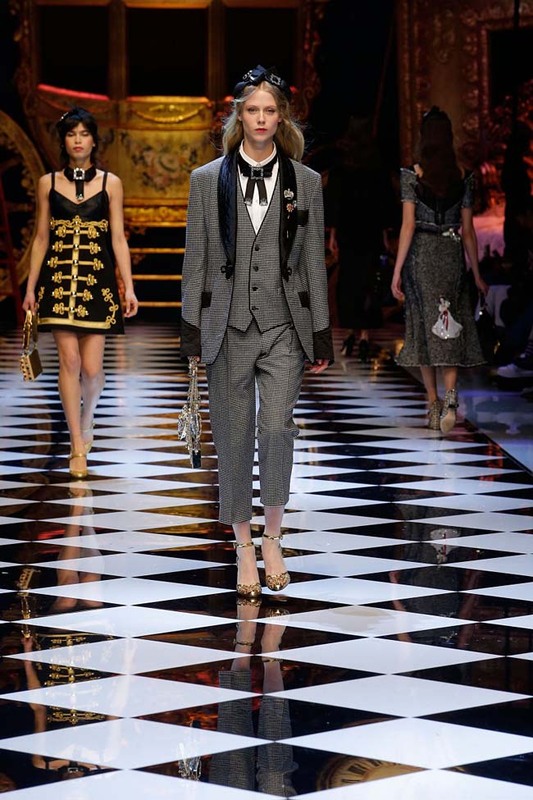 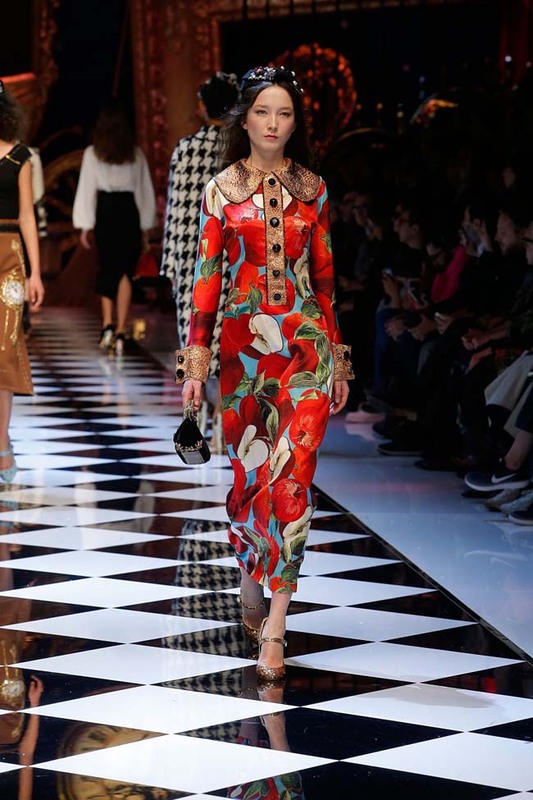 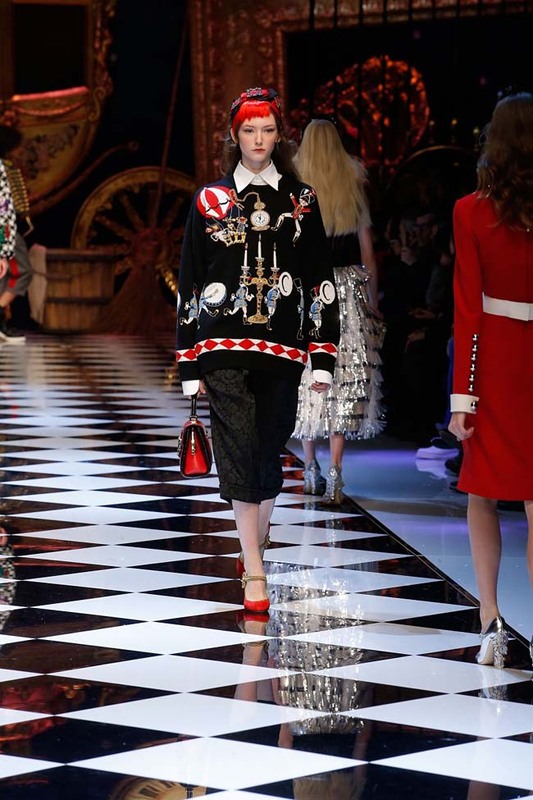 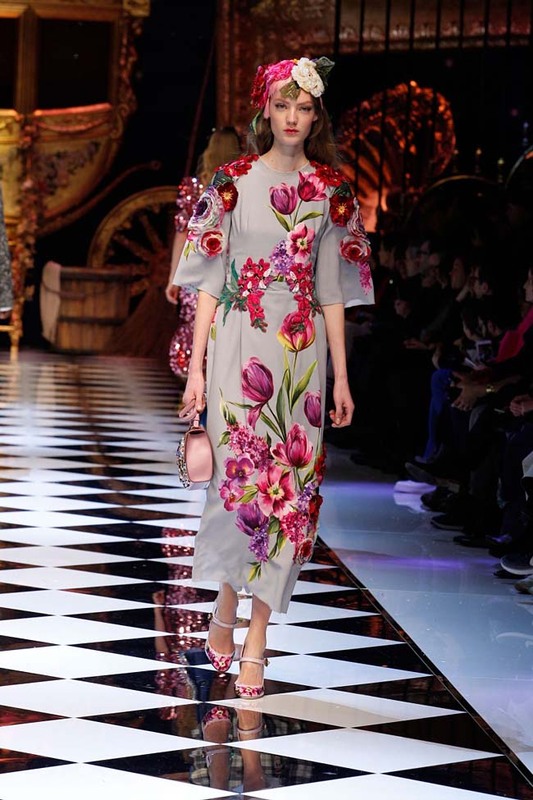 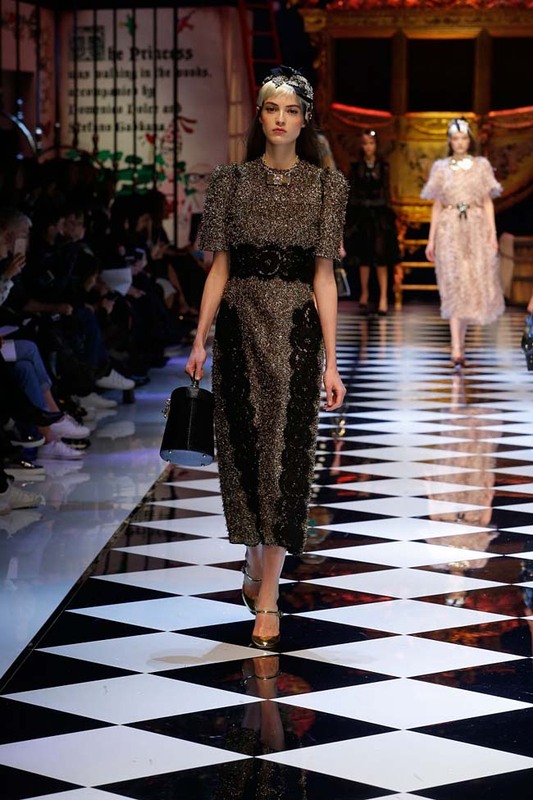 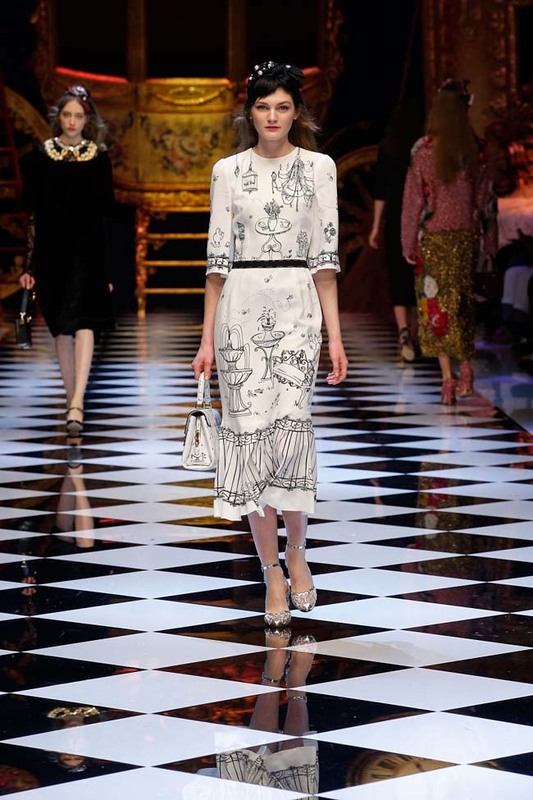 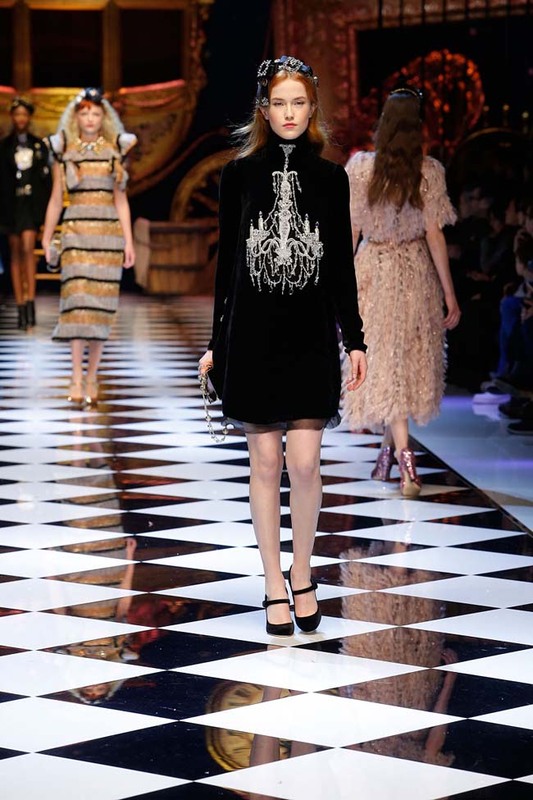 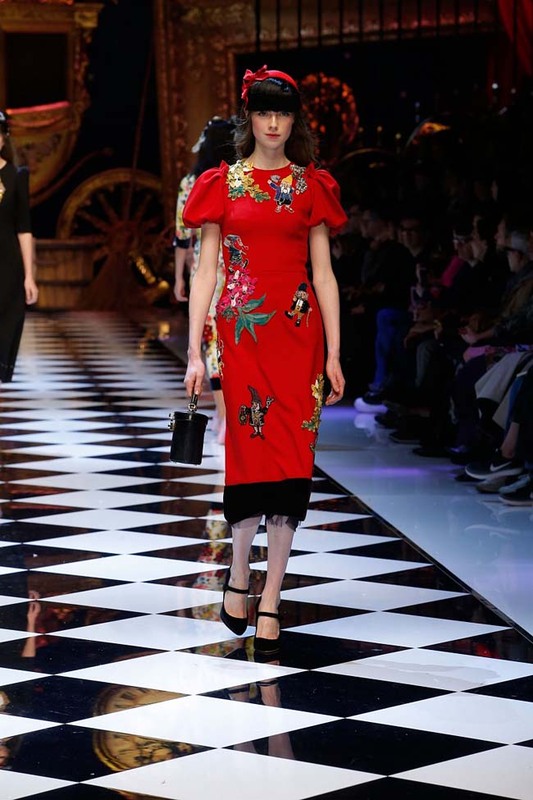 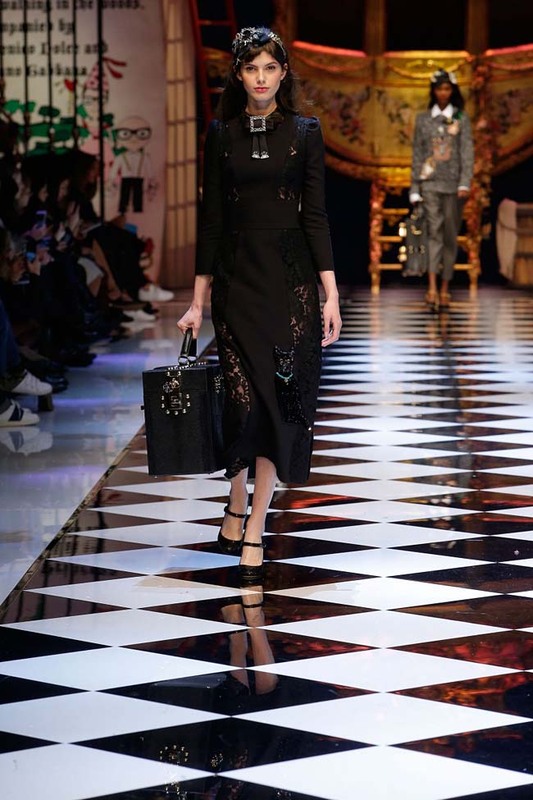 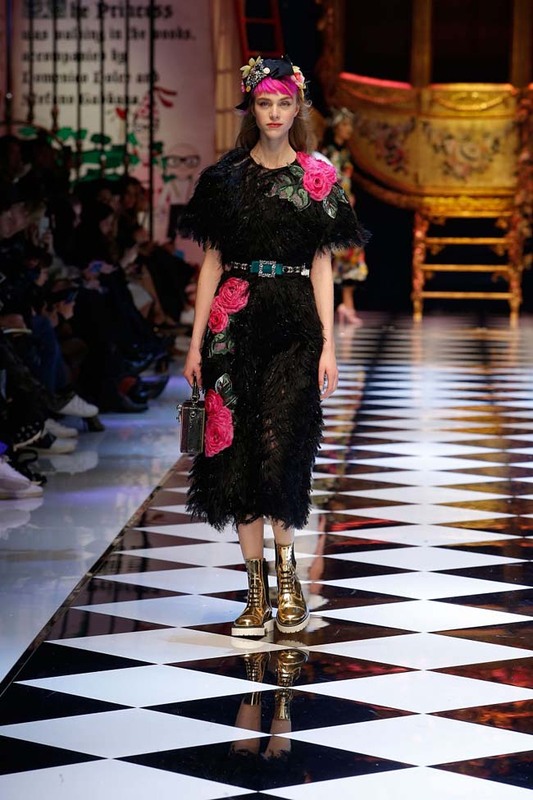 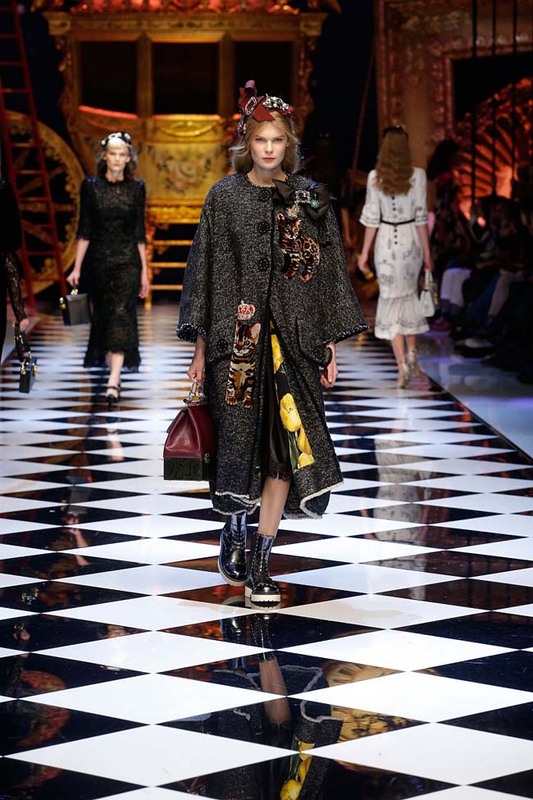 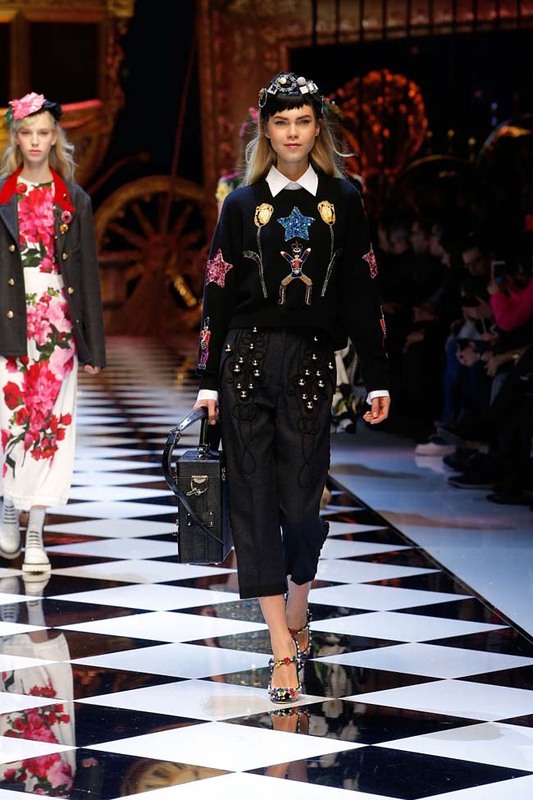 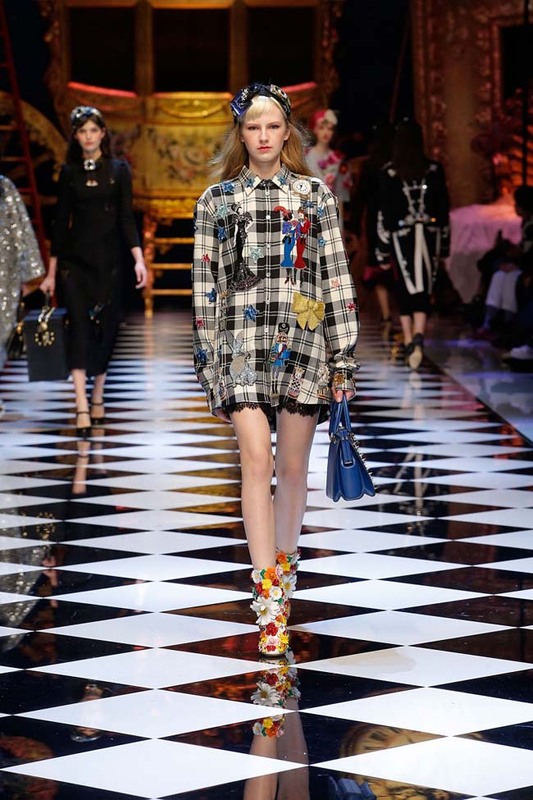 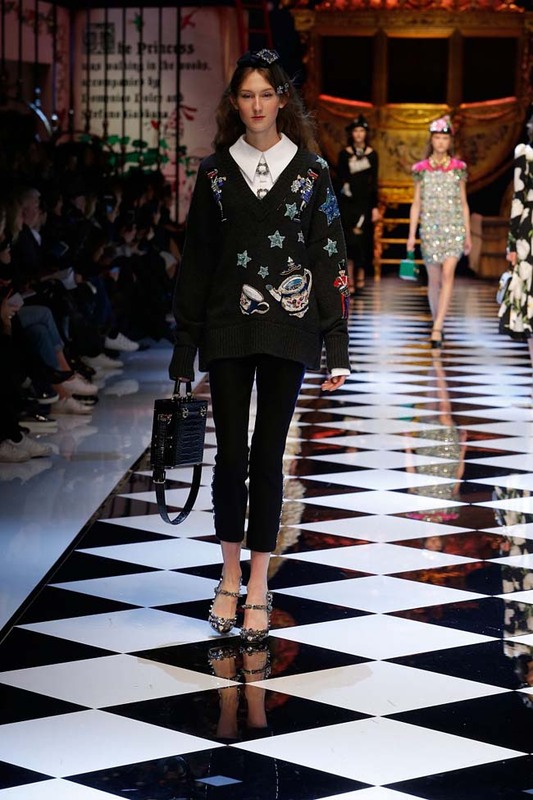 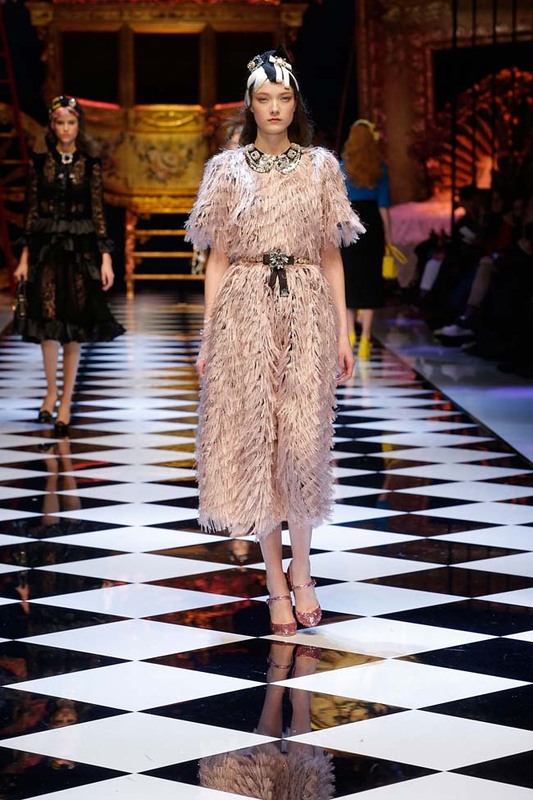 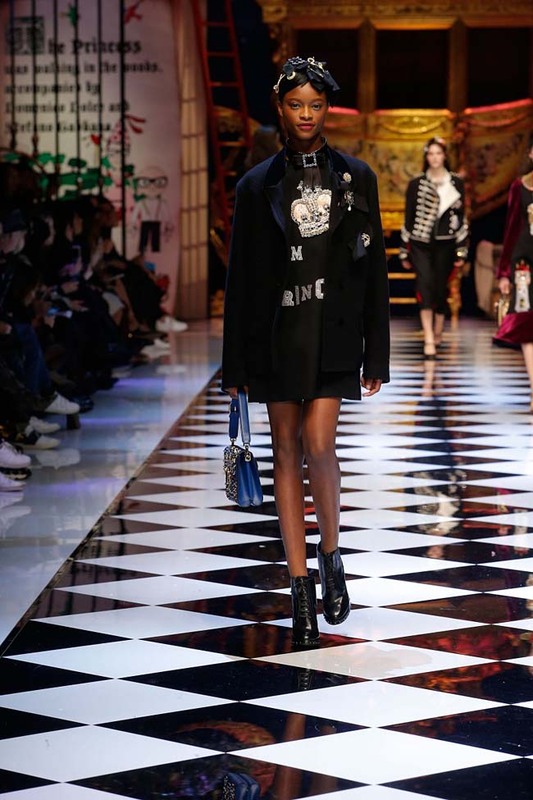 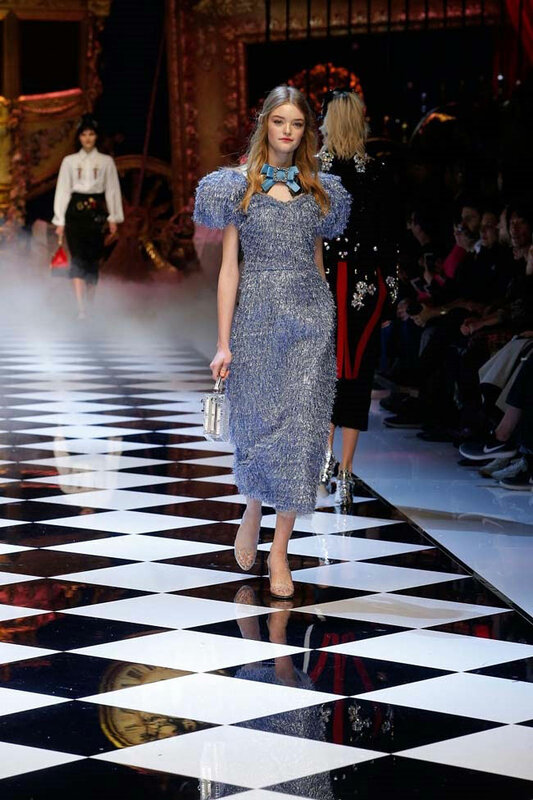 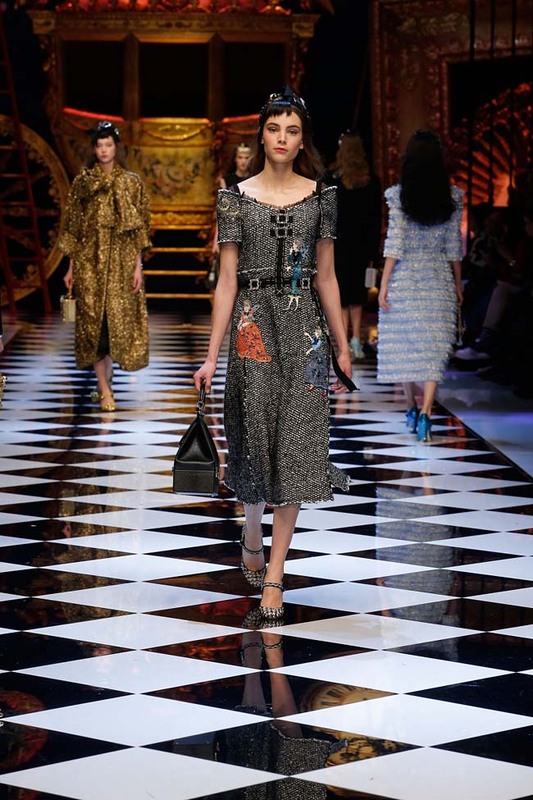 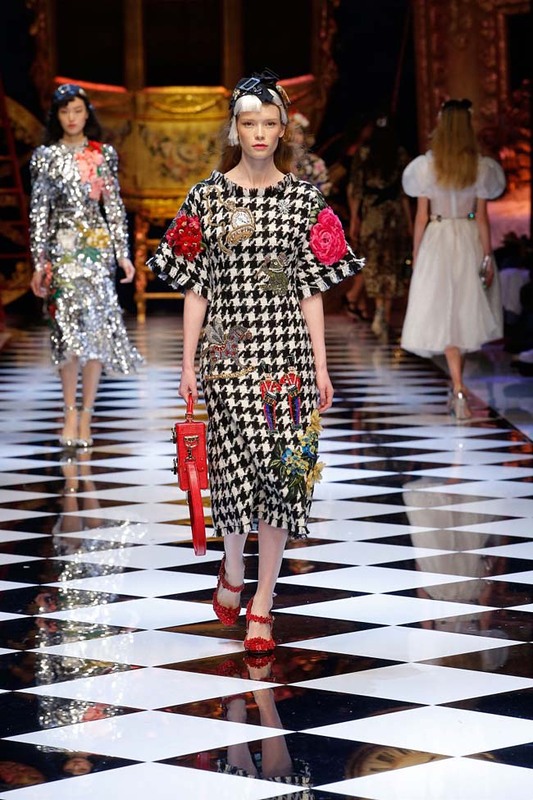 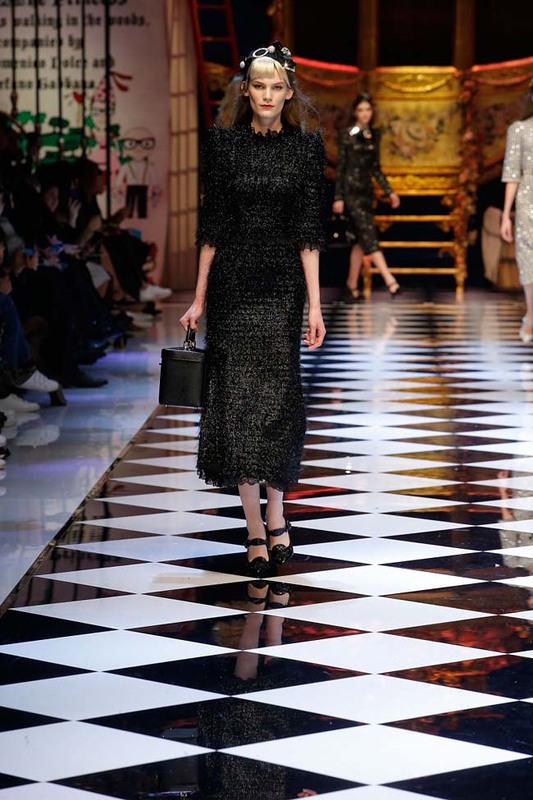 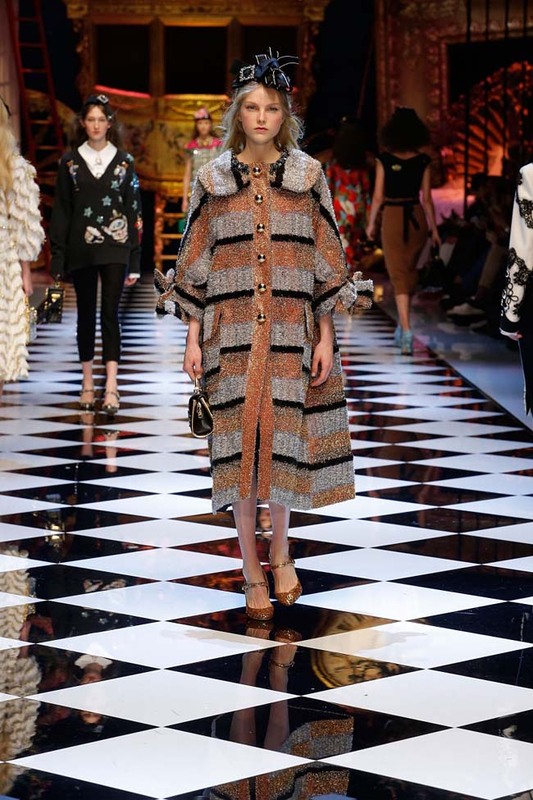 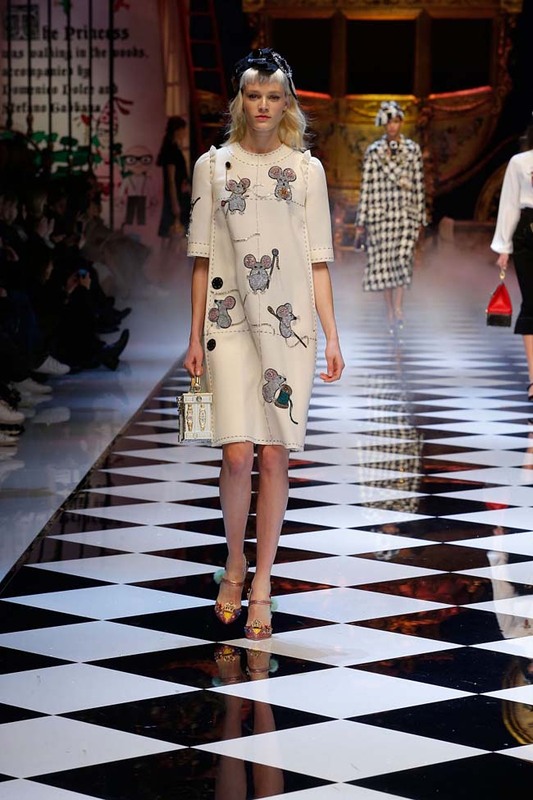 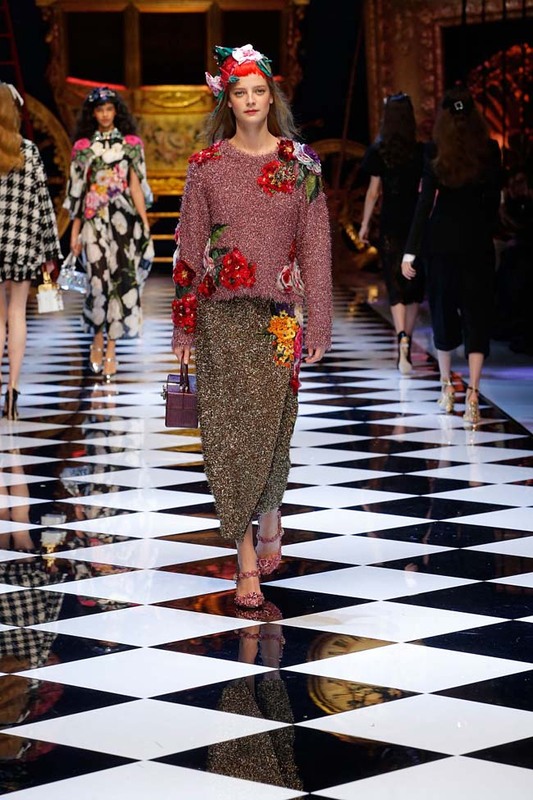 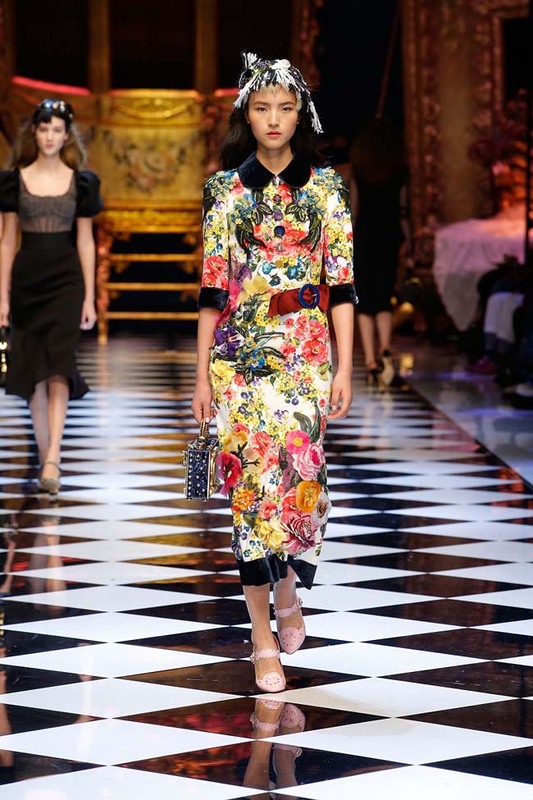 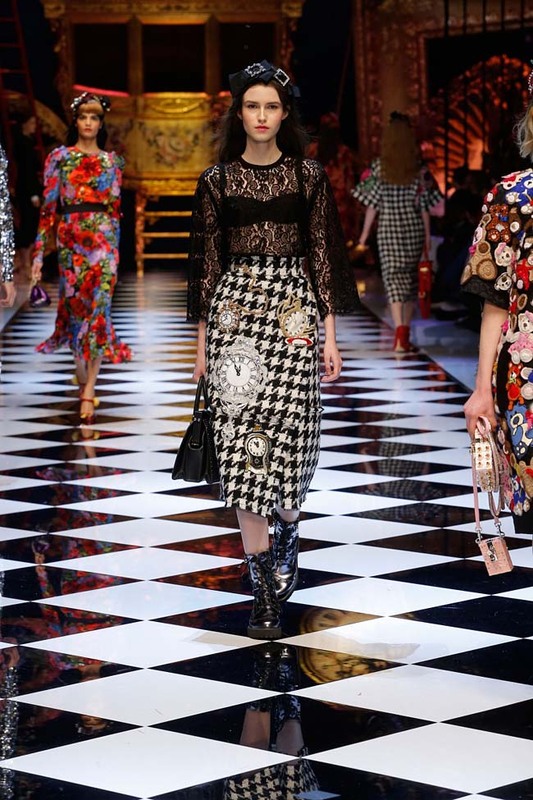 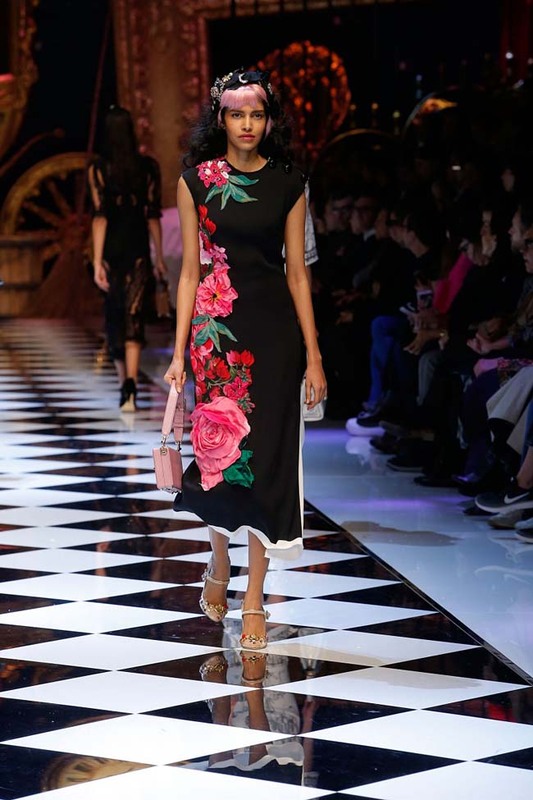 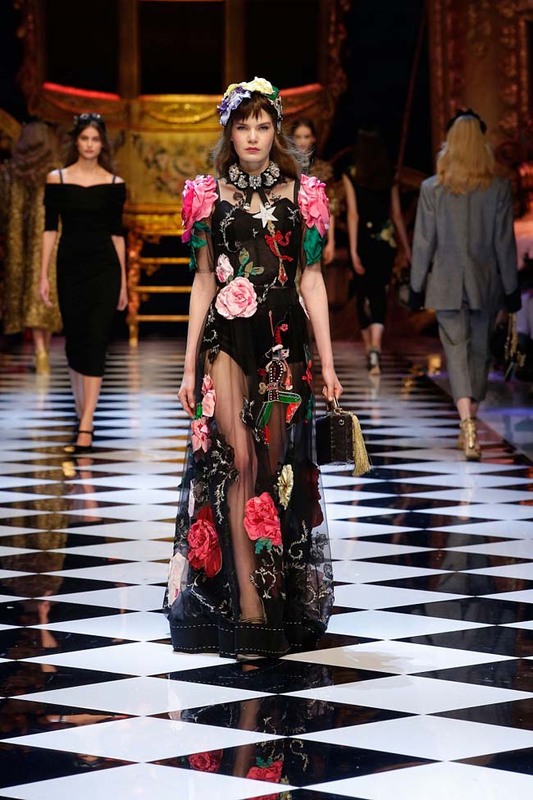 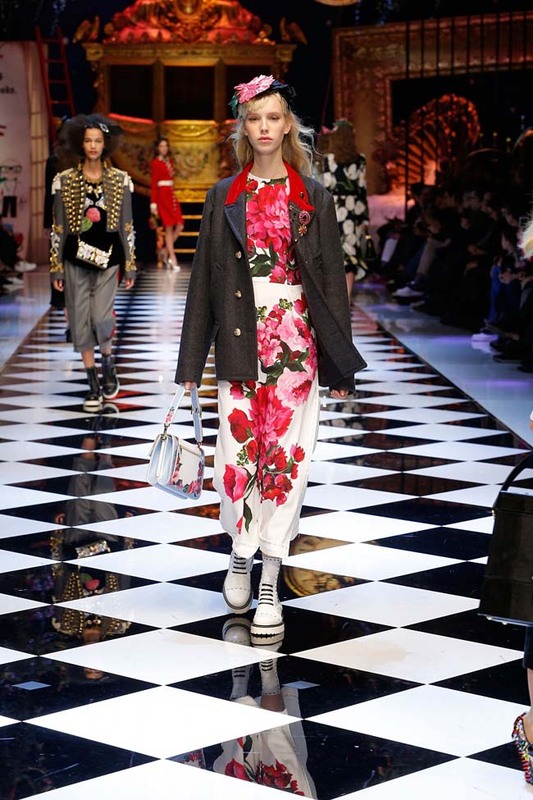 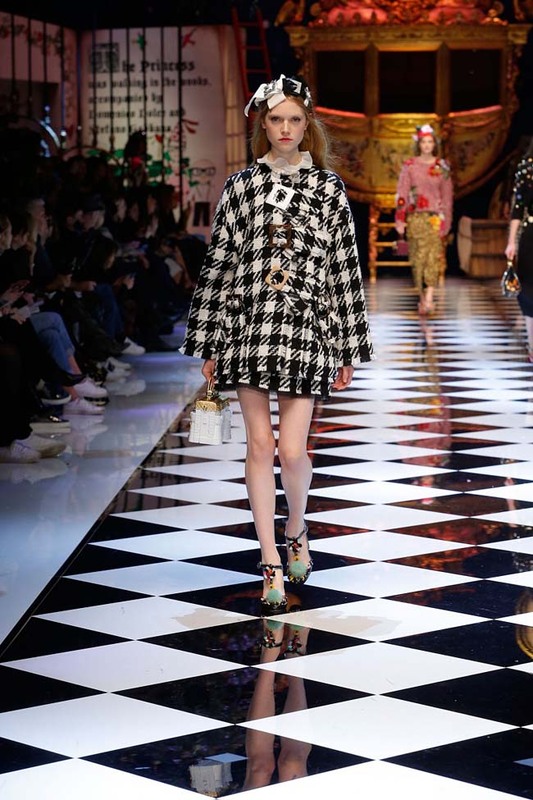 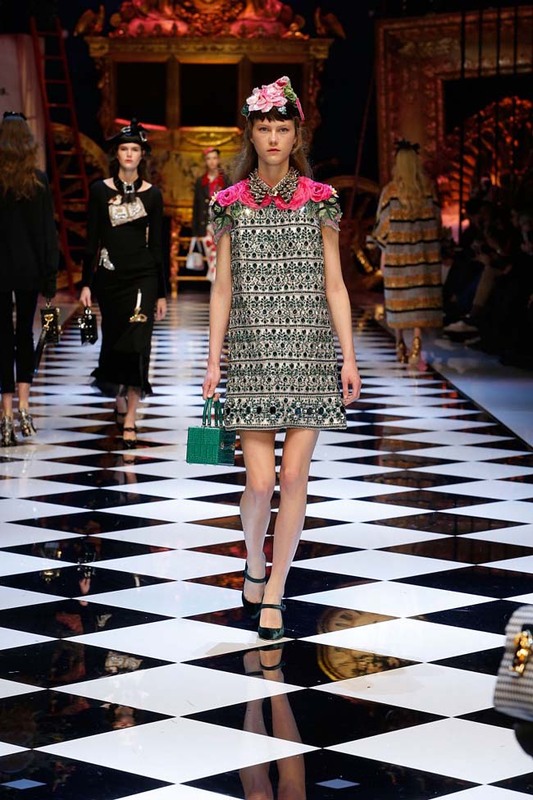 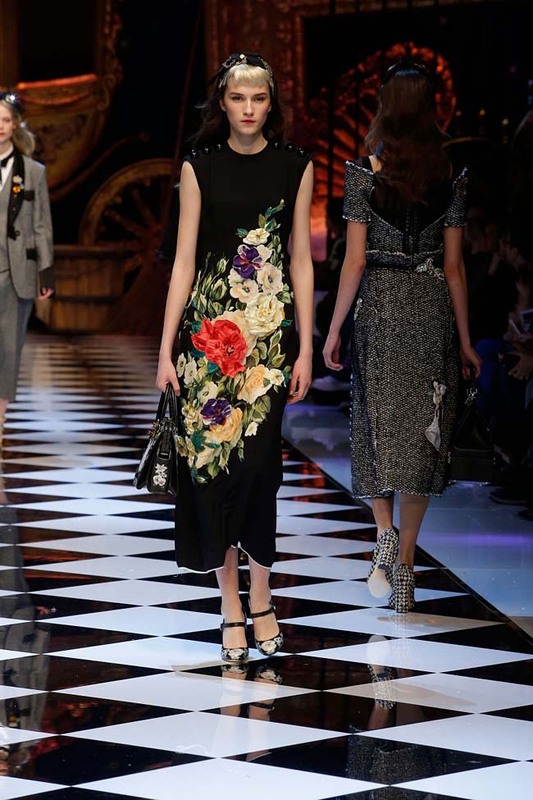 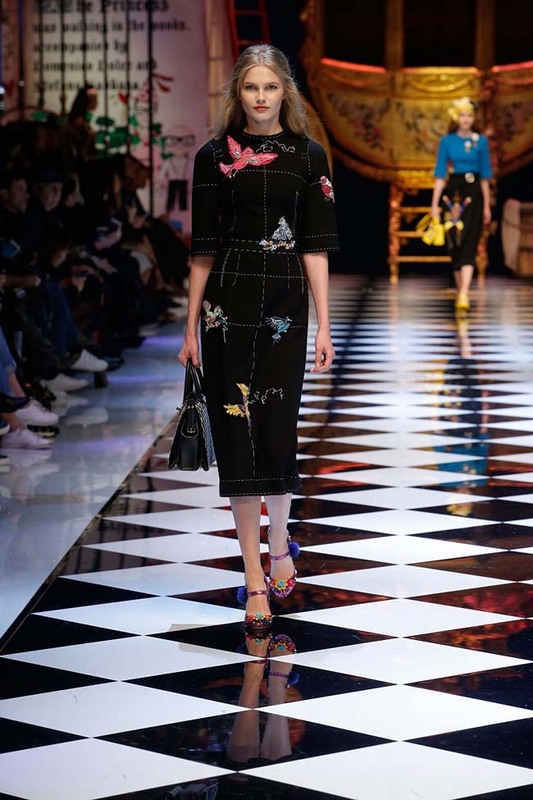 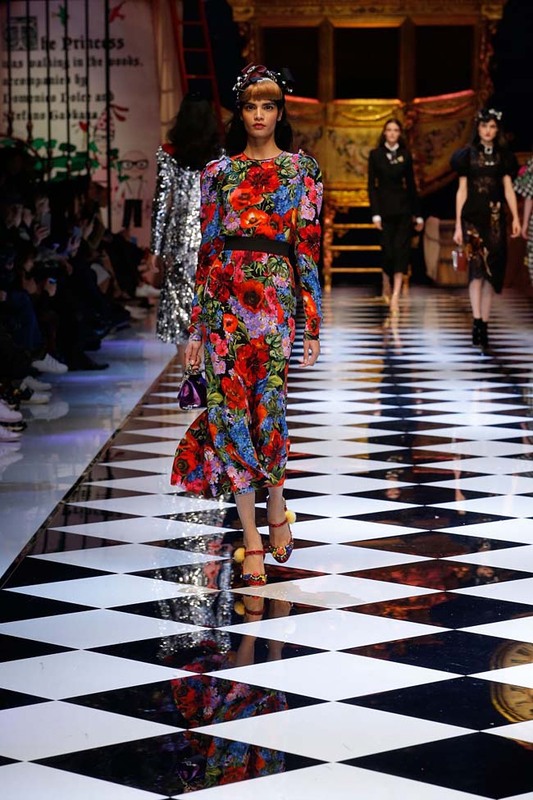 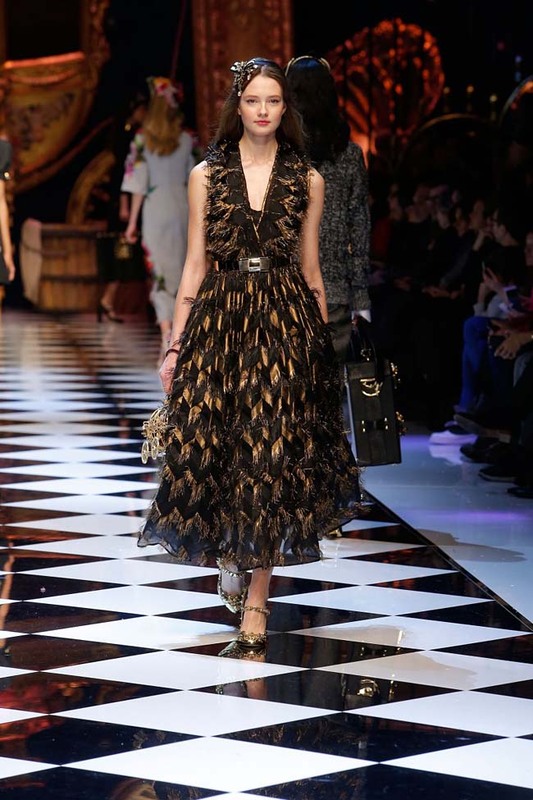 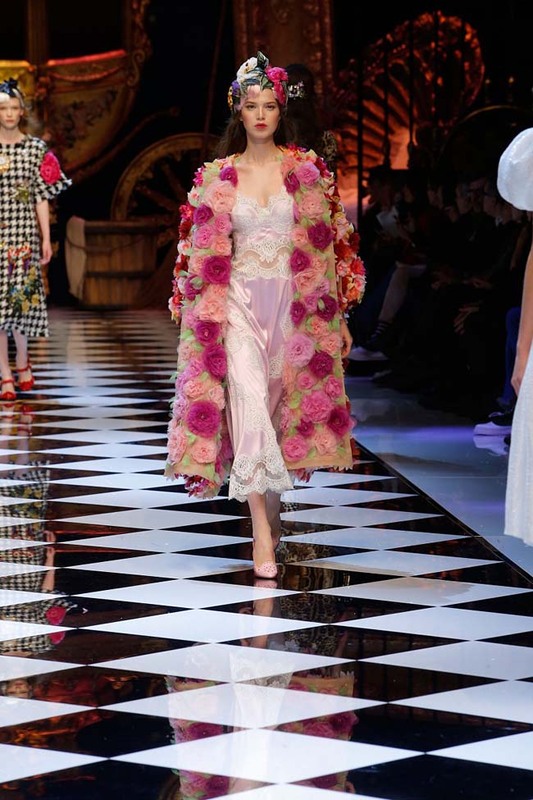 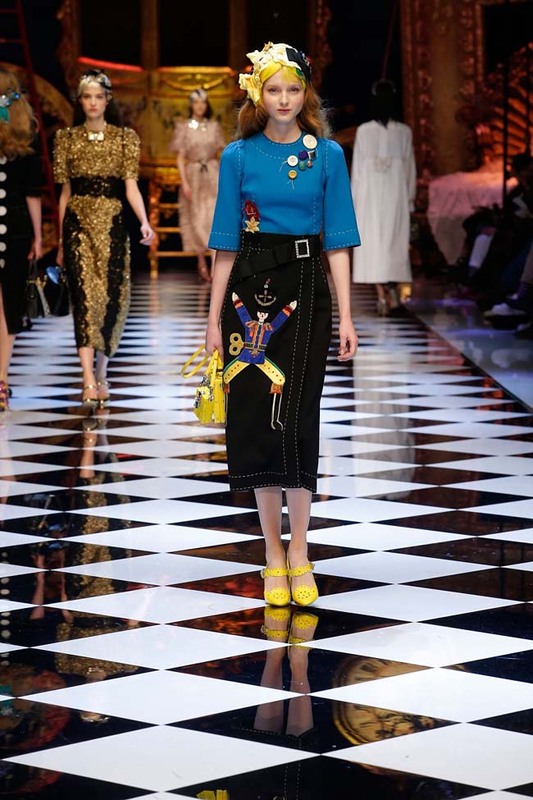 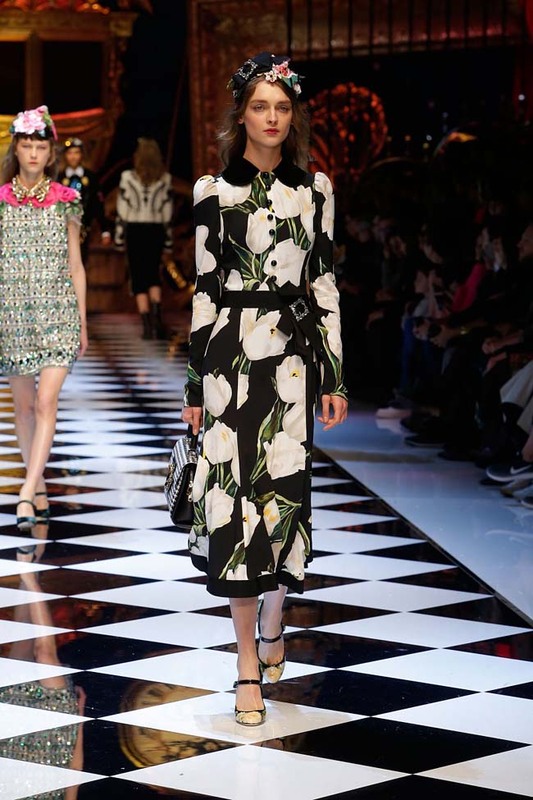 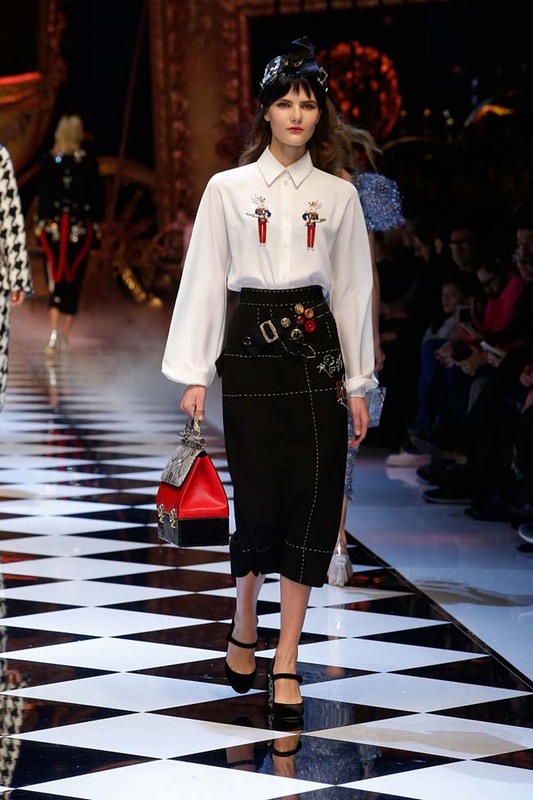 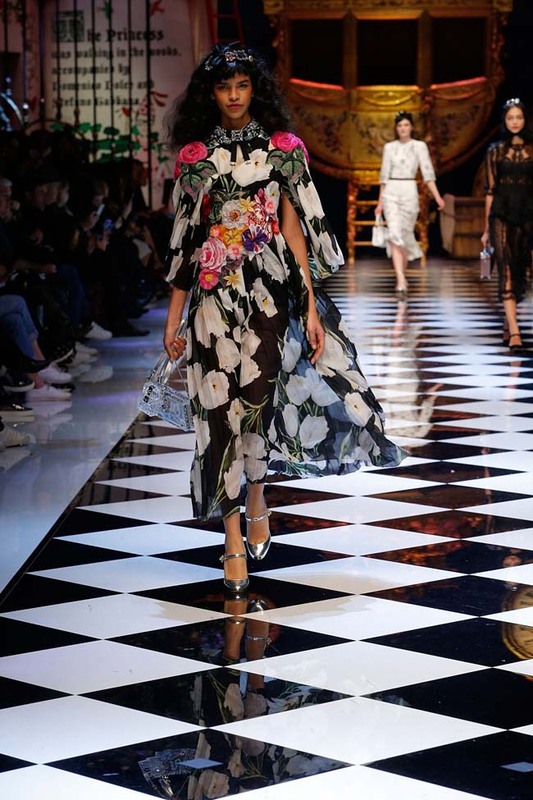 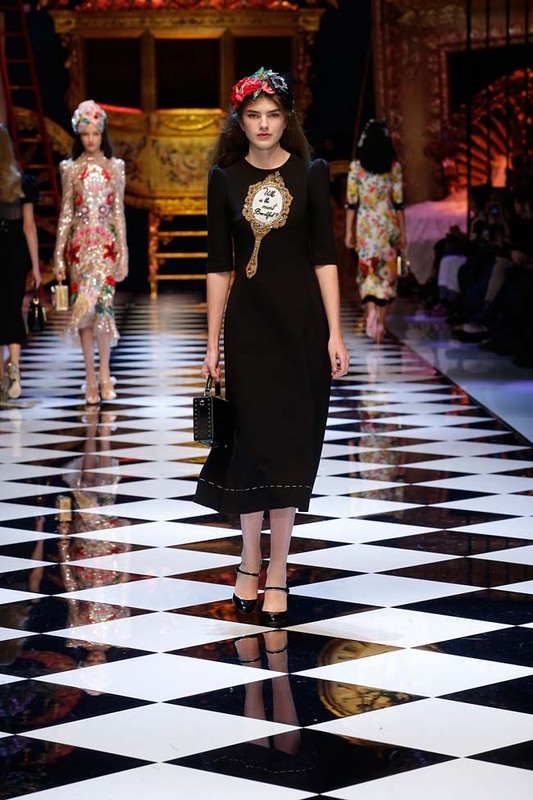 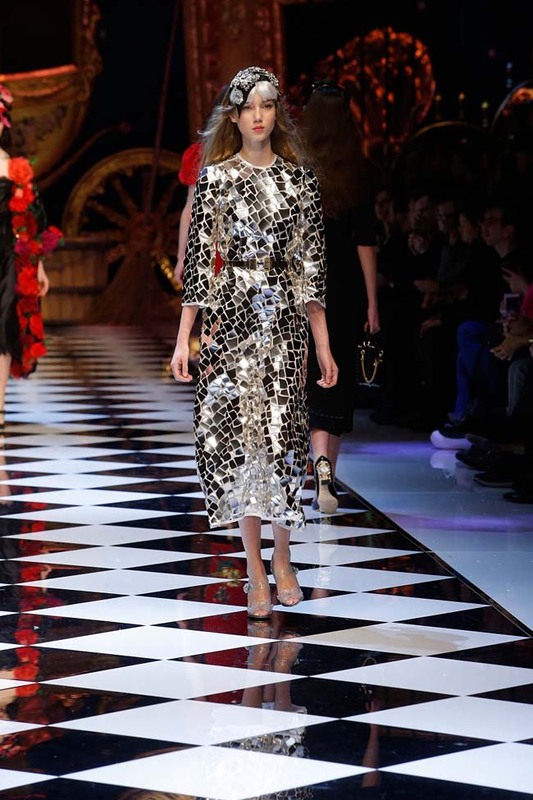 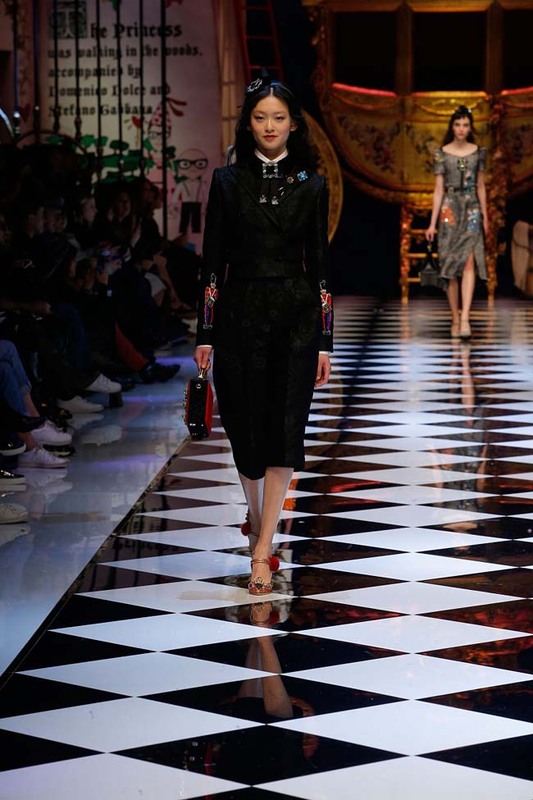 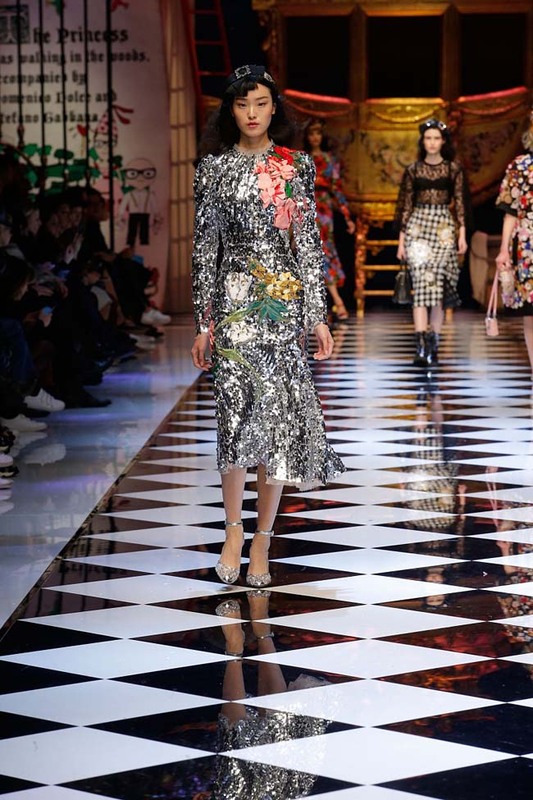 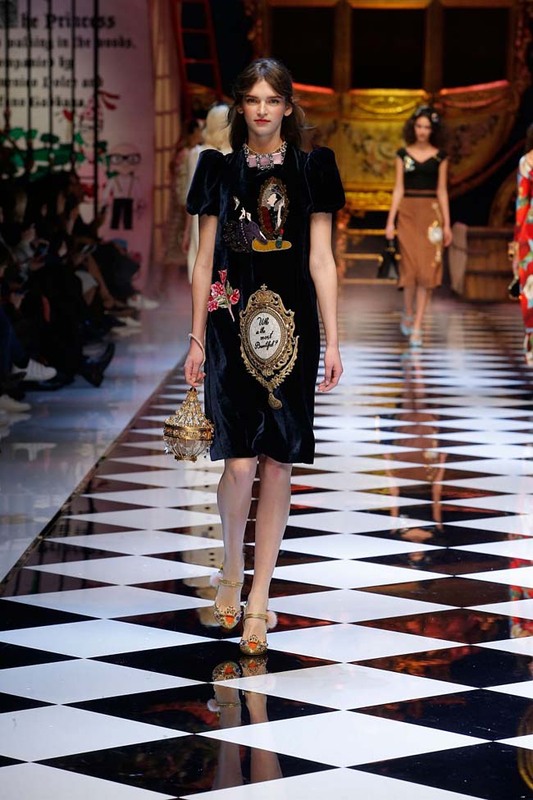 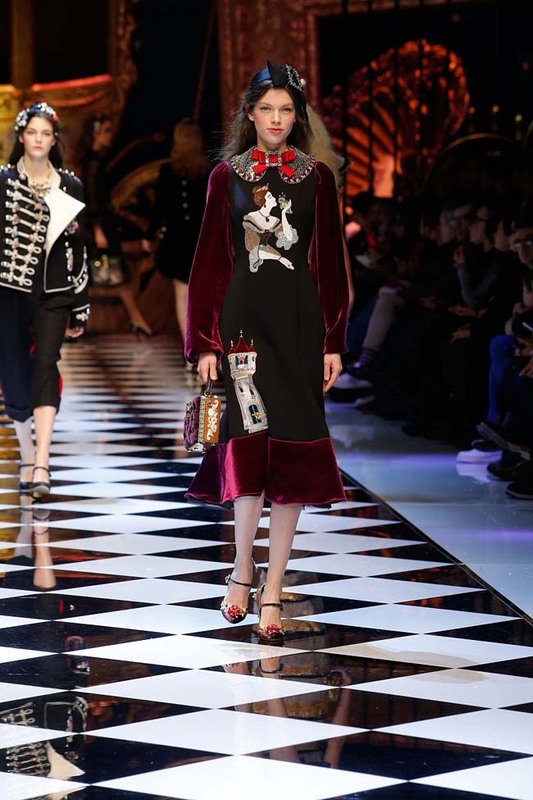 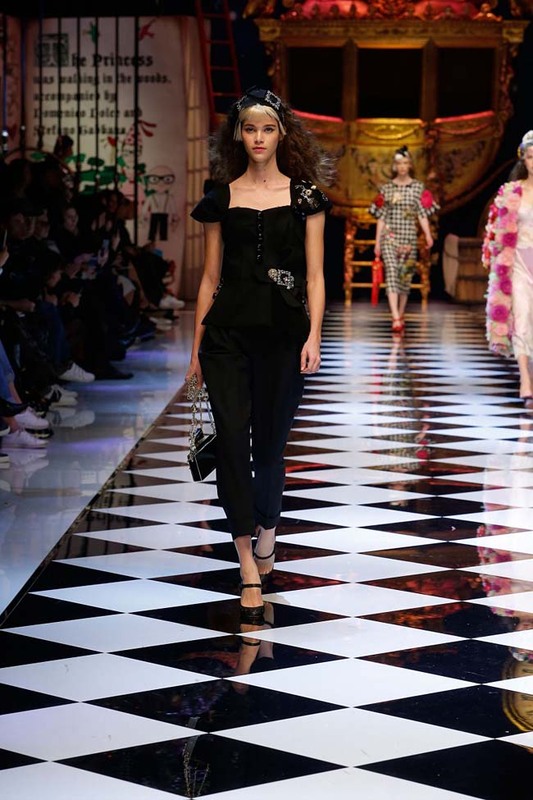 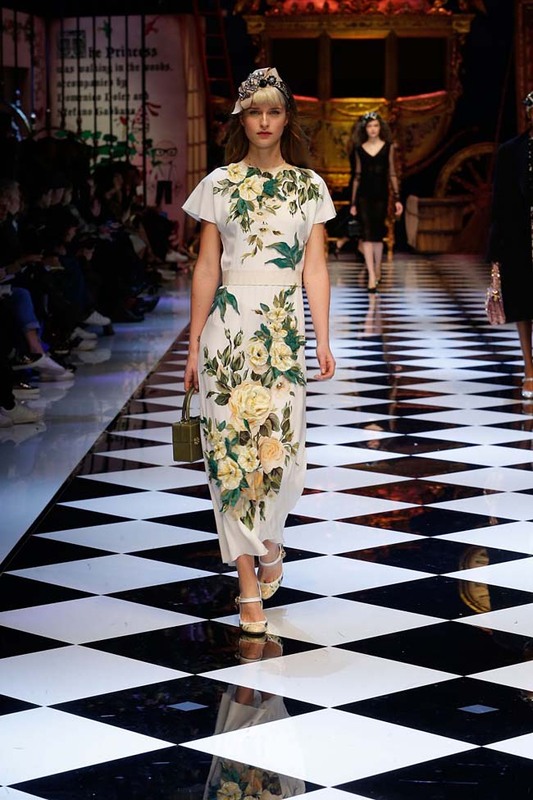 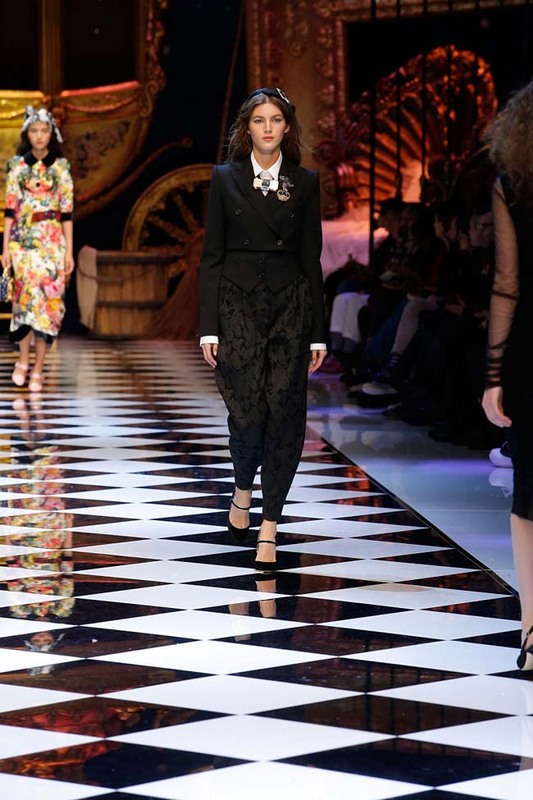 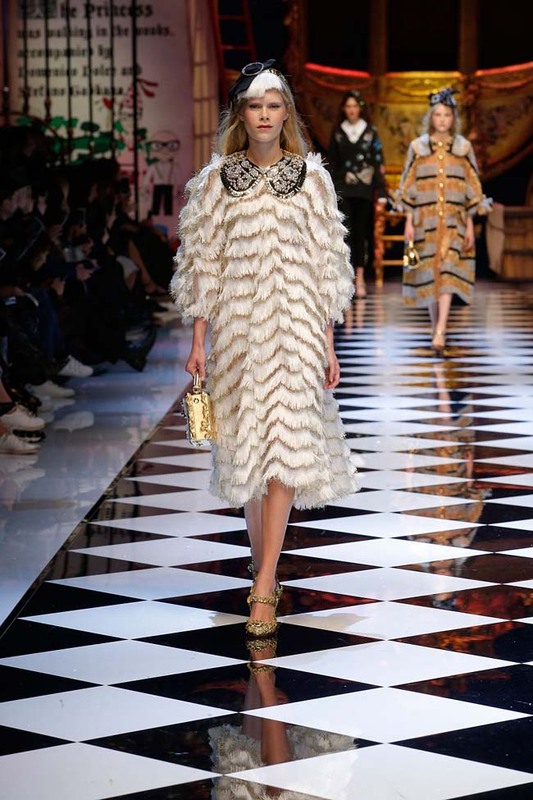 Dolce & Gabbana Fall Winter 2016-17 ready-to-wear collection was rich, feminine and elegant! 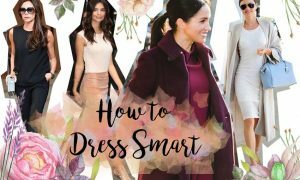 See all the looks here and discover our favorite outfits. 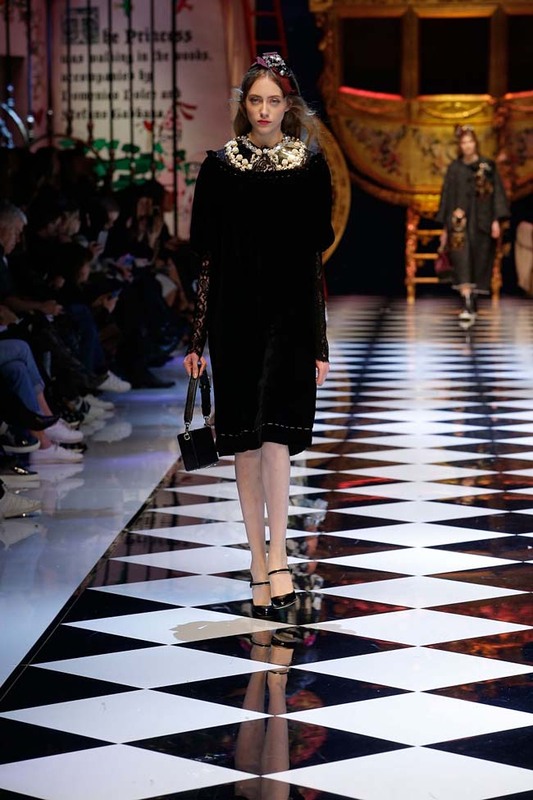 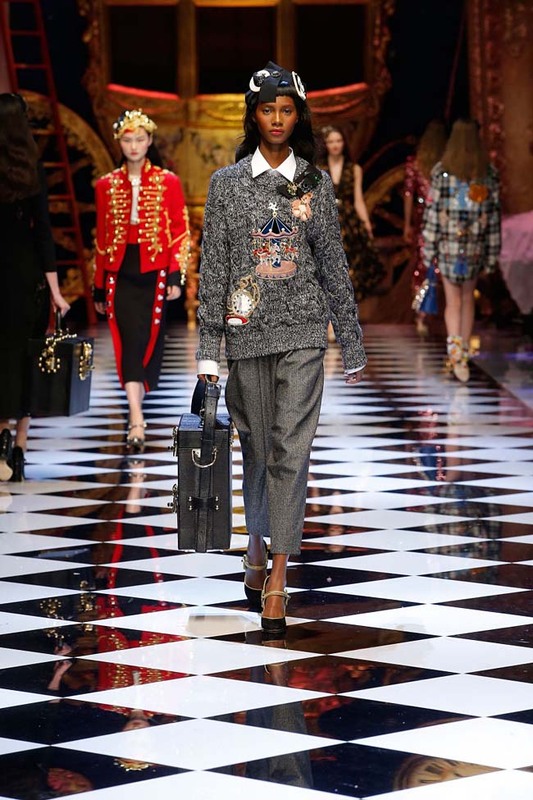 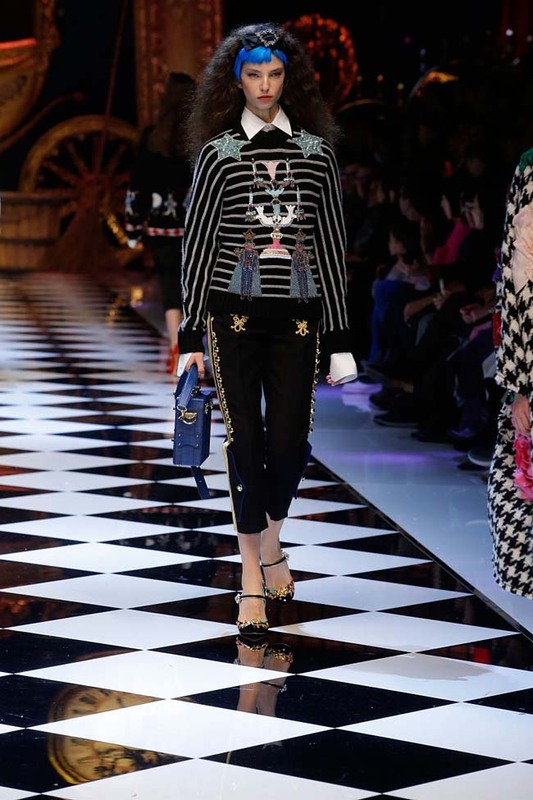 The Dolce & Gabbana Fall Winter 2016-17 collection is rightly titled ‘Fabulous Fantasy’. 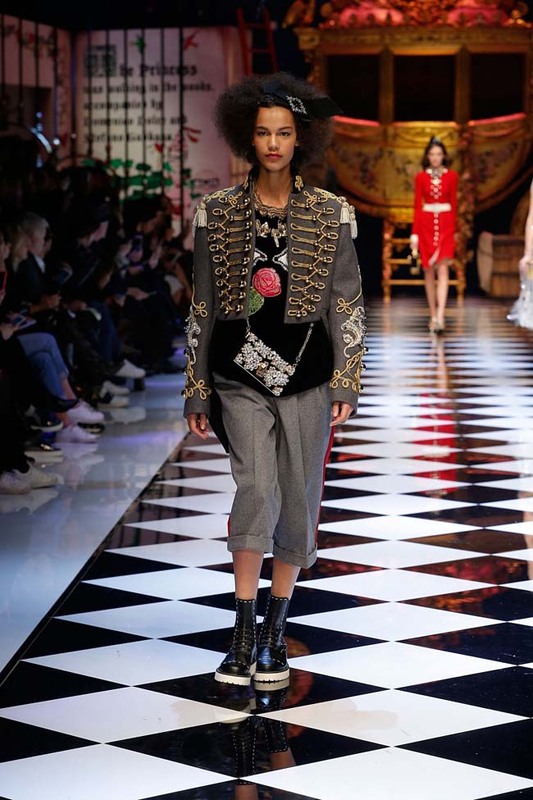 According to the fashion house, the collection is where “the intimate dream of every woman to be a princess becomes reality”. 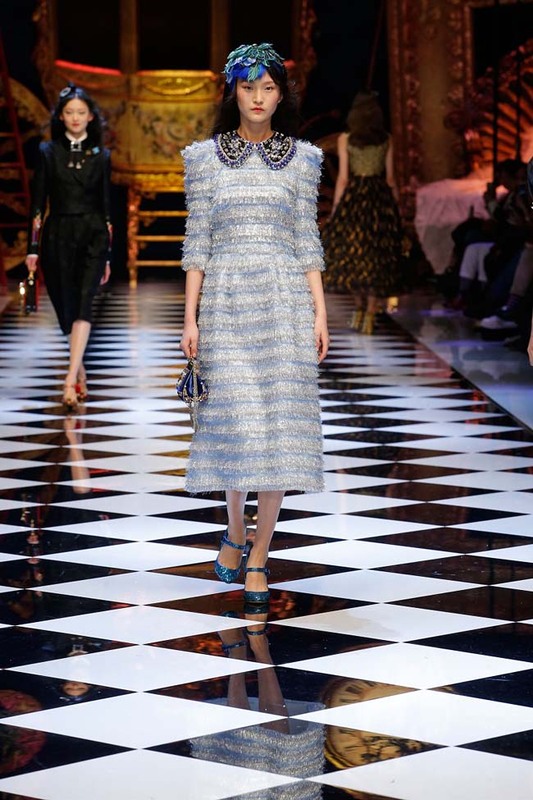 The fashion show was extravagant and majestic. 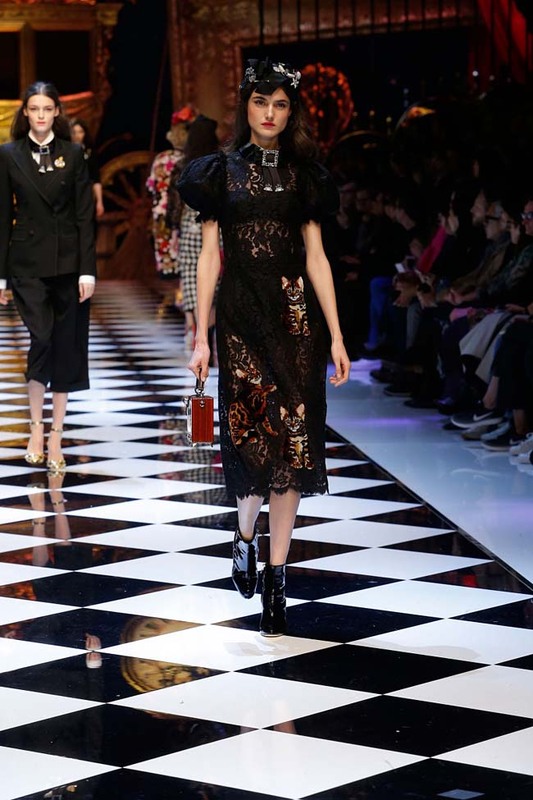 It didn’t focus on balance and modernity – but instead on a classy feminine allure. 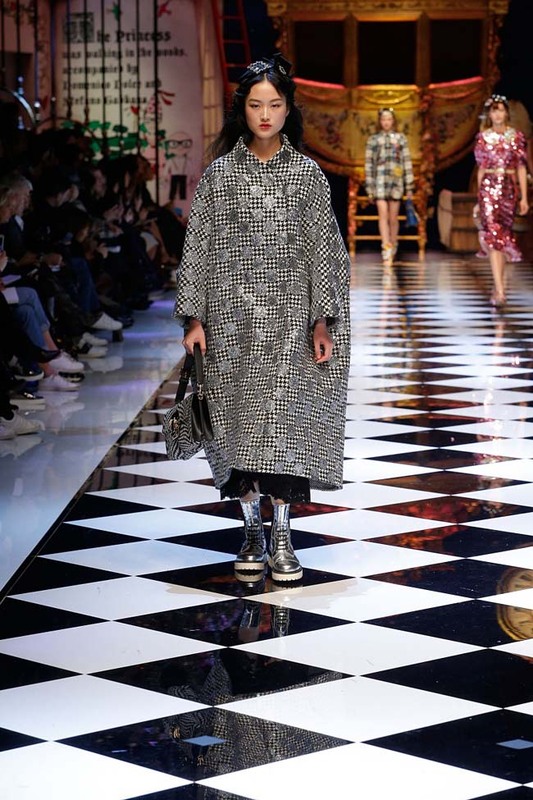 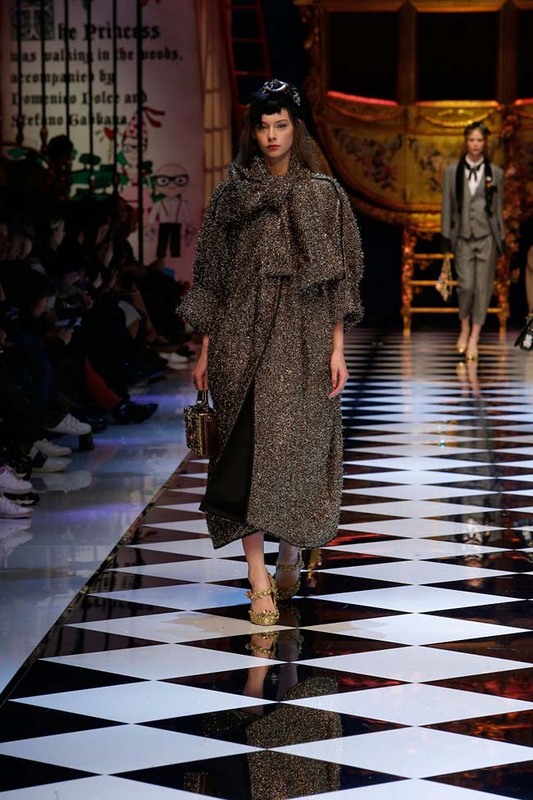 Rich fabrics were unabashedly covered in sequins and embellishments, structured silhouettes were accompanied by unmissable accessories and equally elaborate outerwear. 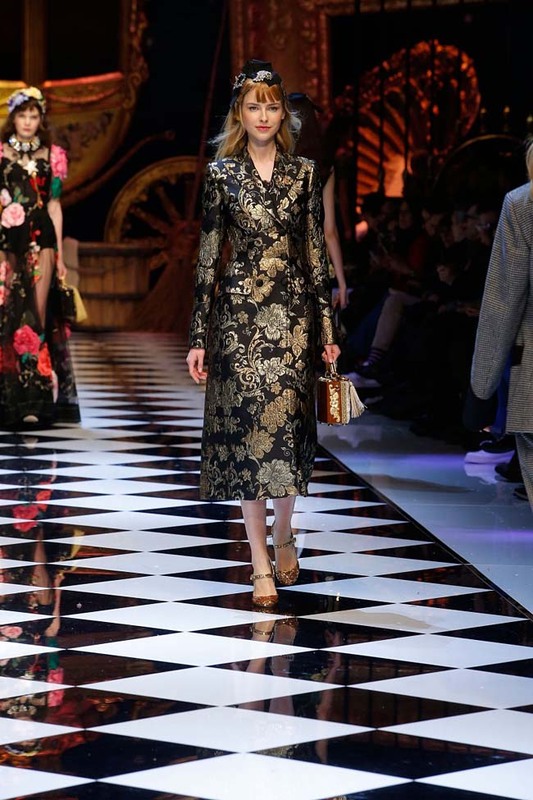 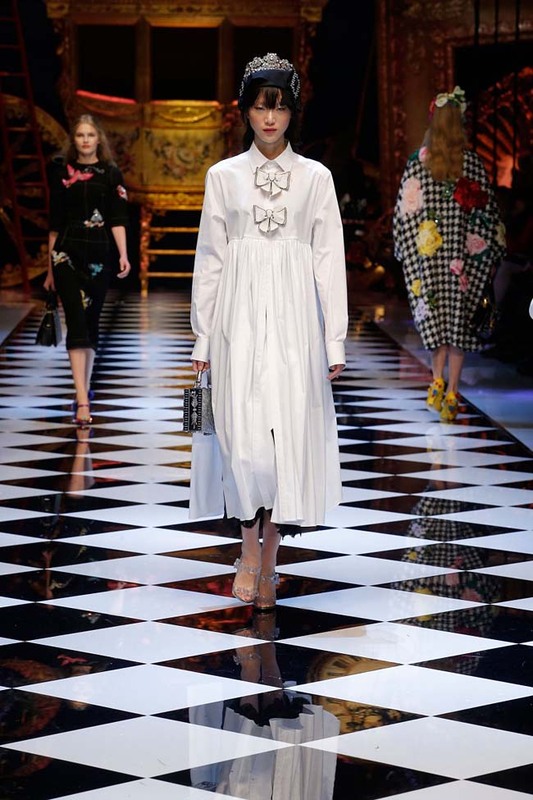 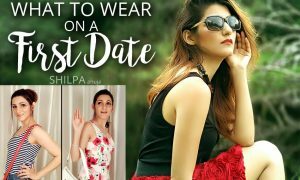 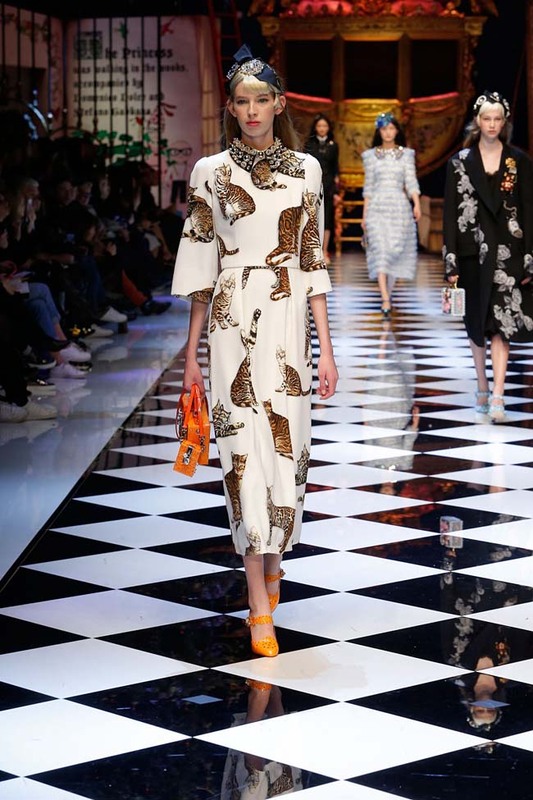 The ensembles included gowns, midi-dresses, knee-length skirts, asymmetric midi-skirts, jackets, coats and suits. 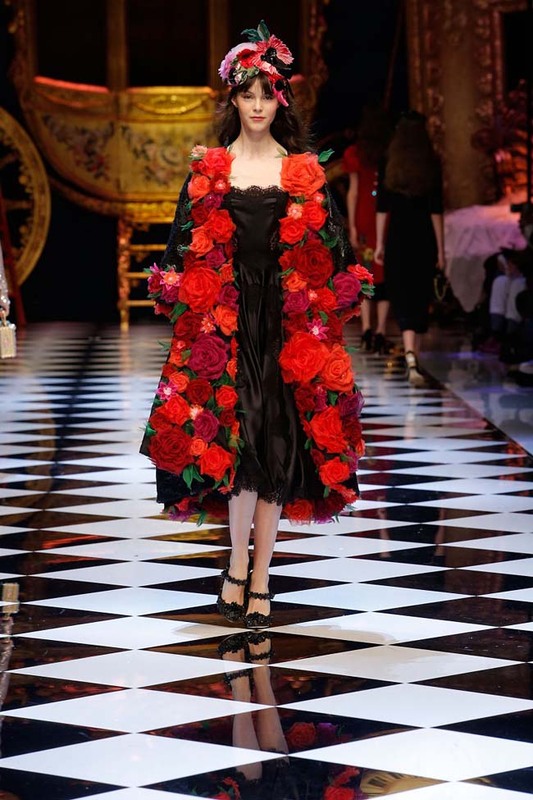 The fabrics used were velvet, tulle, sequin, silk, brocade, organza and lace. 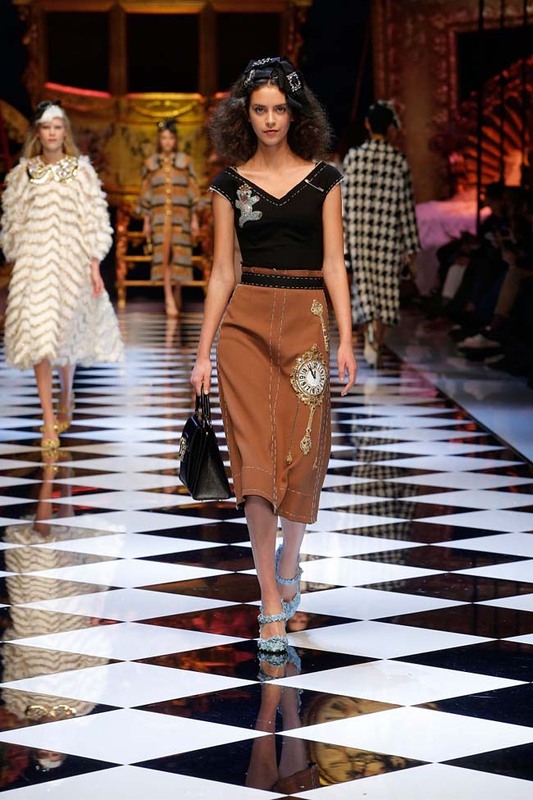 The color palette was made up of neutrals – tan, brown, cream, white and lots of black. 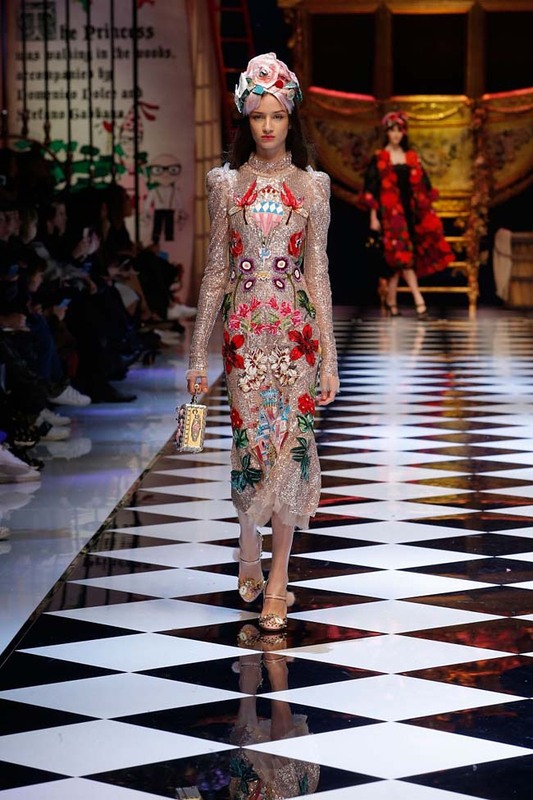 Plus there were appliques in reds, gold and pinks. 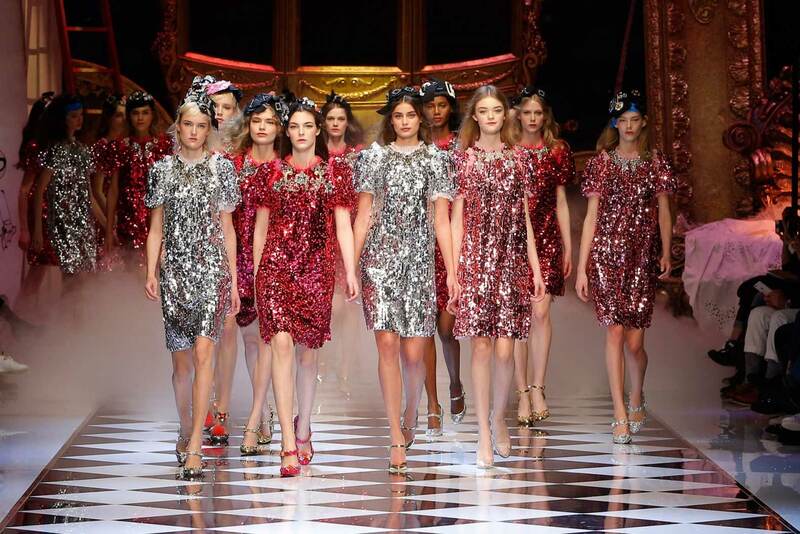 Towards the end the outfits also used magenta, crimson and silver. 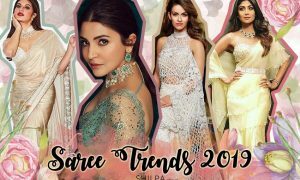 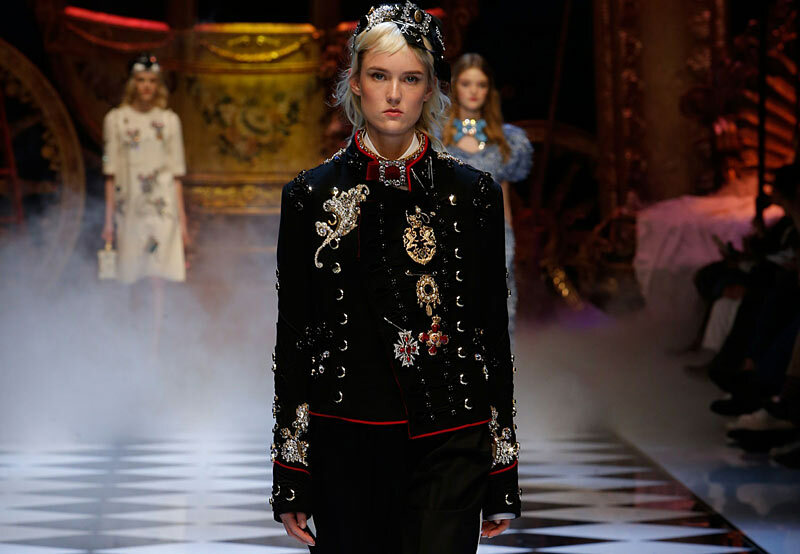 There was a lot of shimmer – with large rhinestone brooches and belt buckles, shimmery threadwork, embellishments, shiny buttons, and sequins that entirely covered some of the dresses. 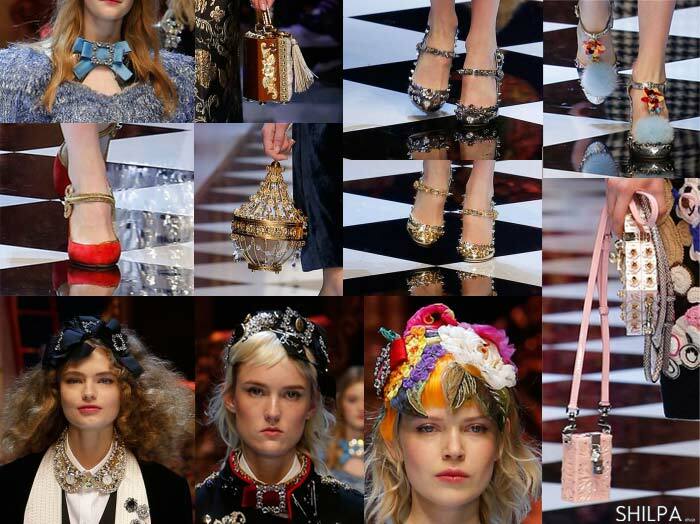 Accessories included chokers, collar necklaces, embellished belts, broad embellished headbands, which were like urban-versions tiaras to me. 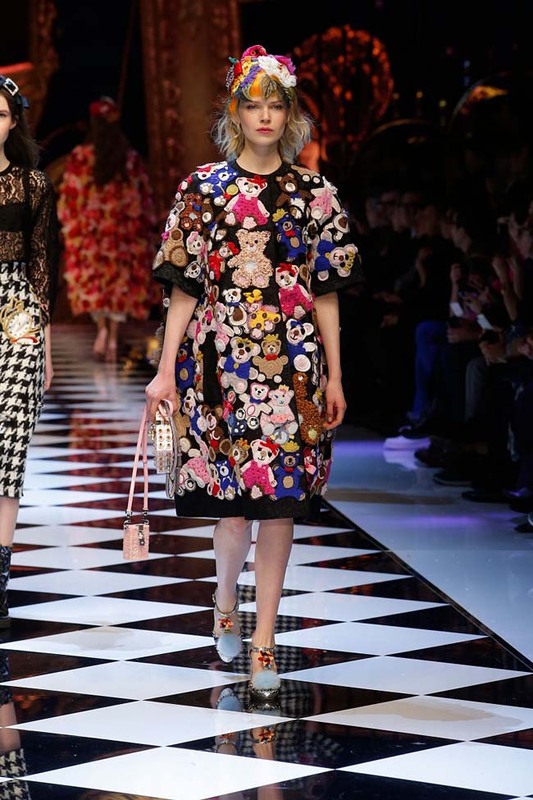 The bags were boy-type – both medium and large sized. 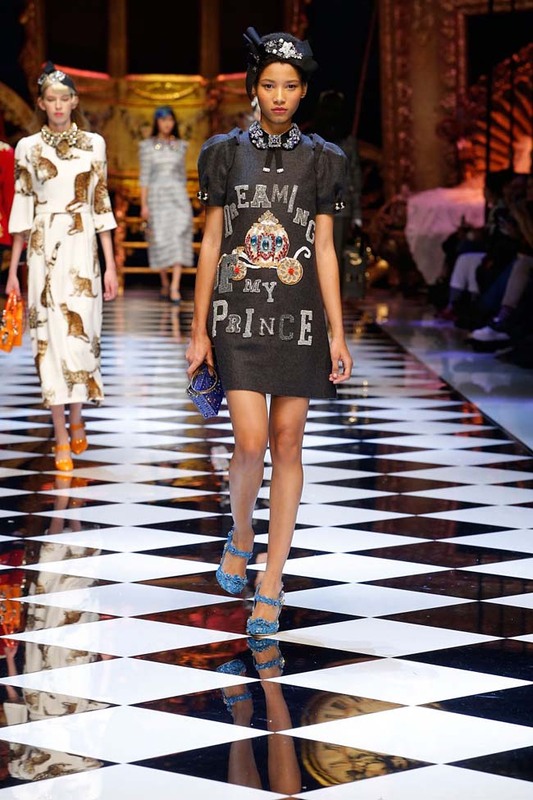 The shoes were kitten heeled sandals, embellished of course, very reminiscent of Dolce & Gabbana’s SS15 collection. 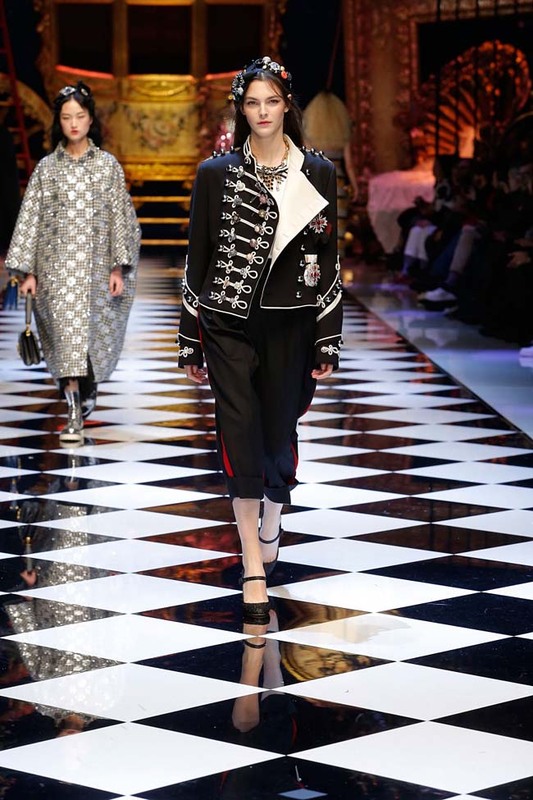 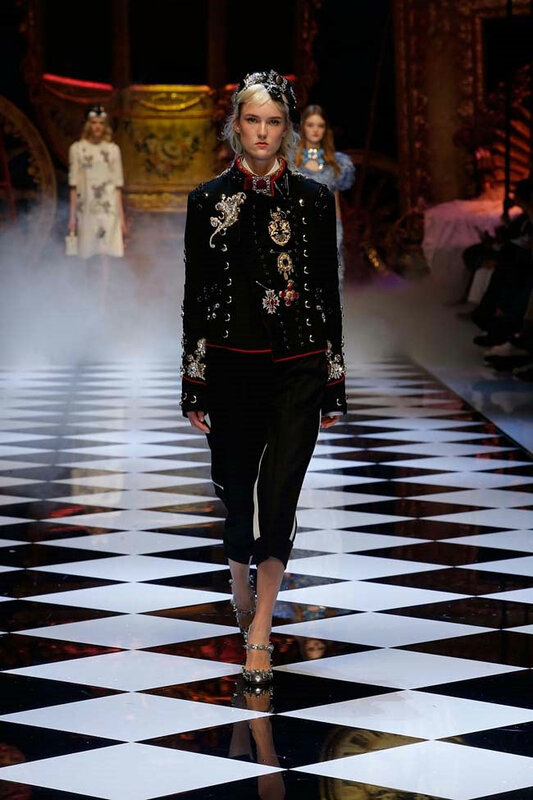 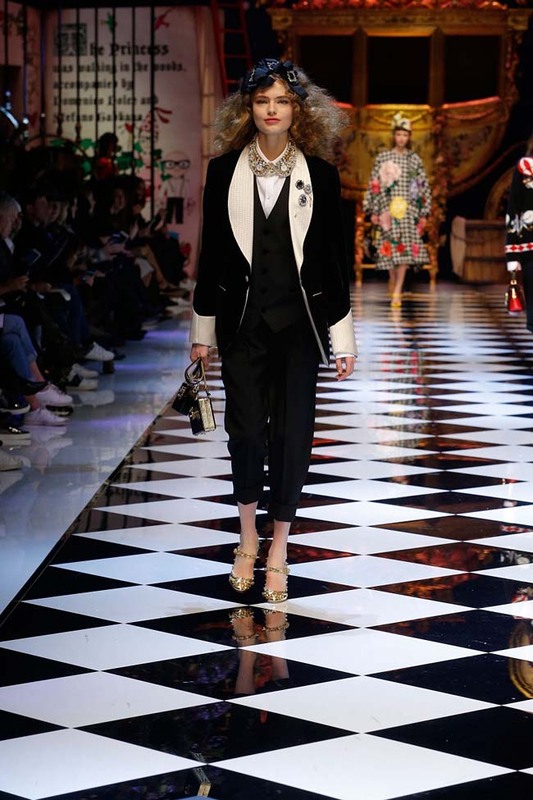 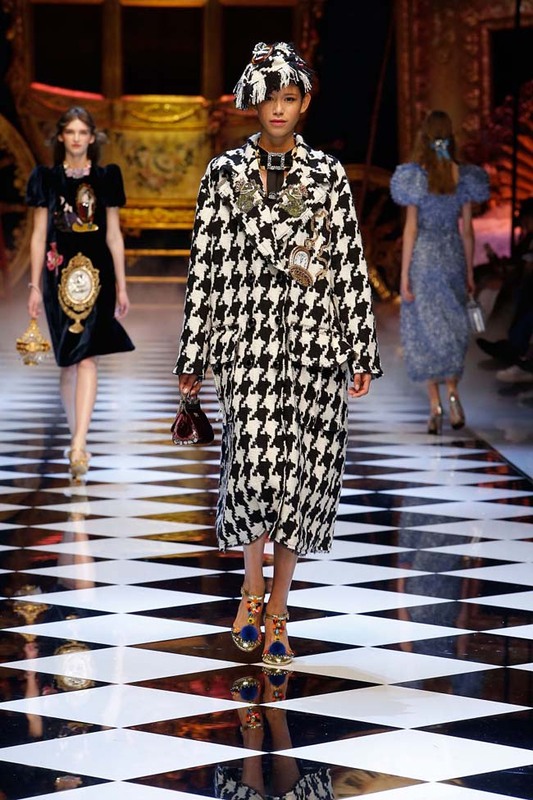 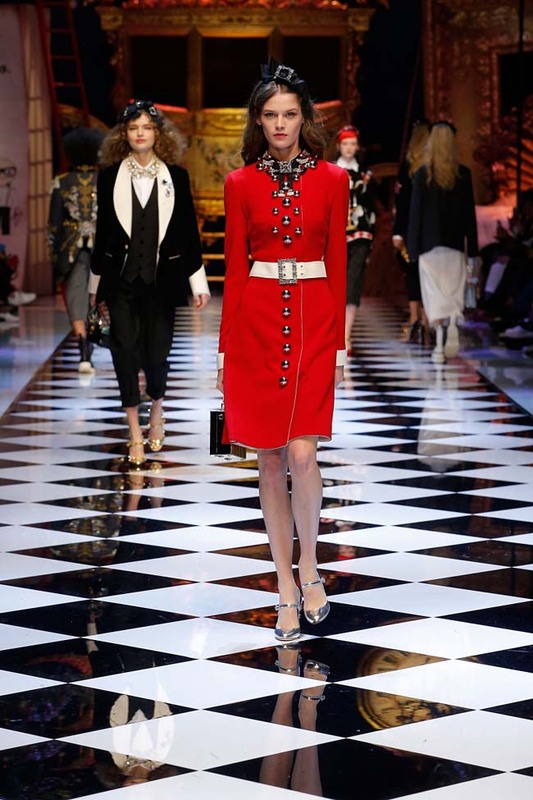 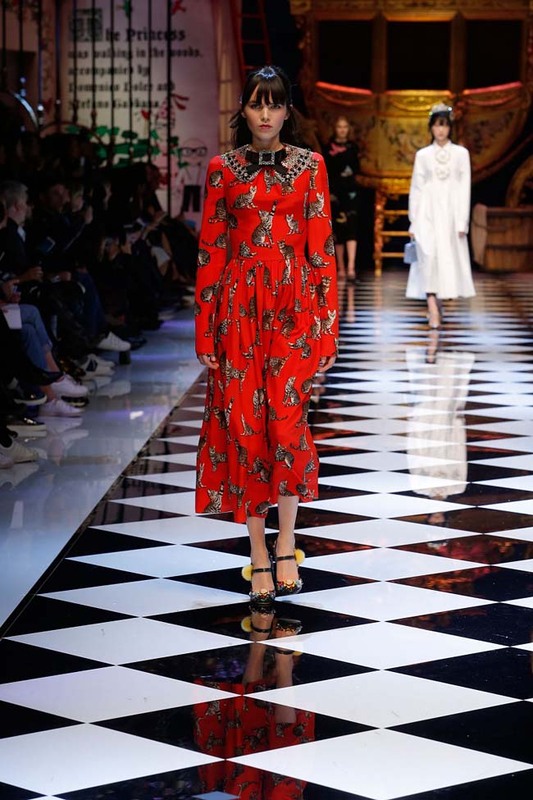 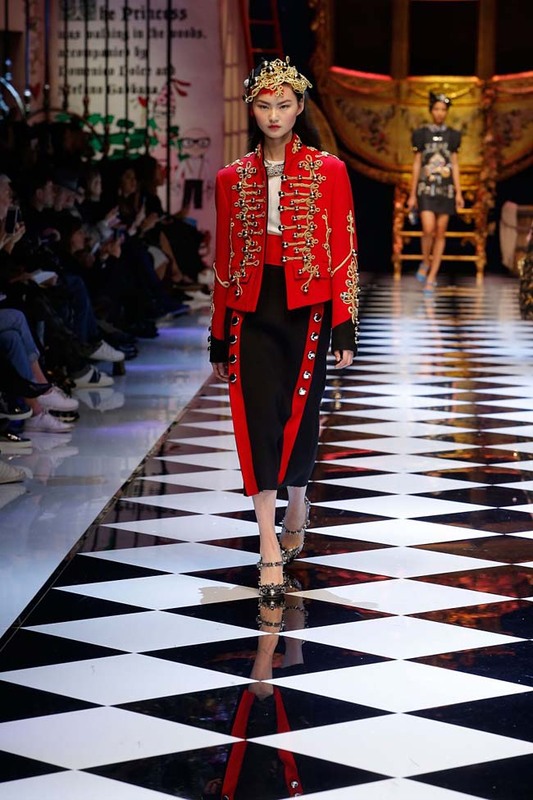 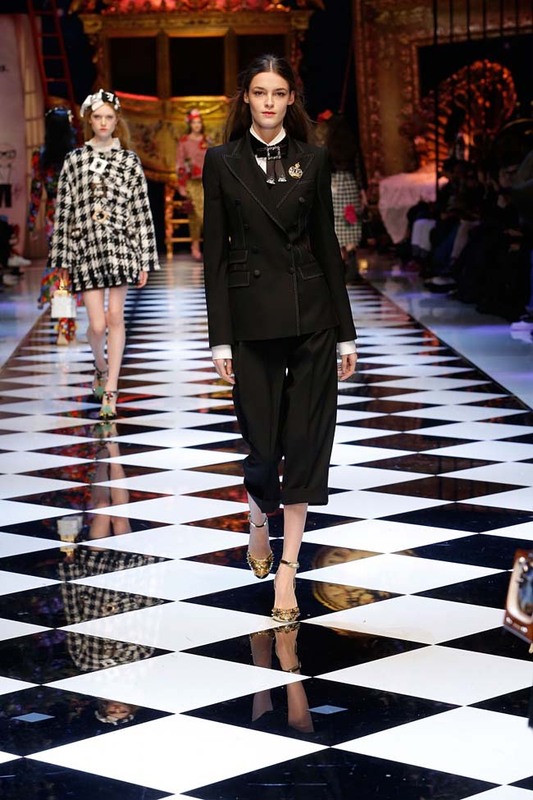 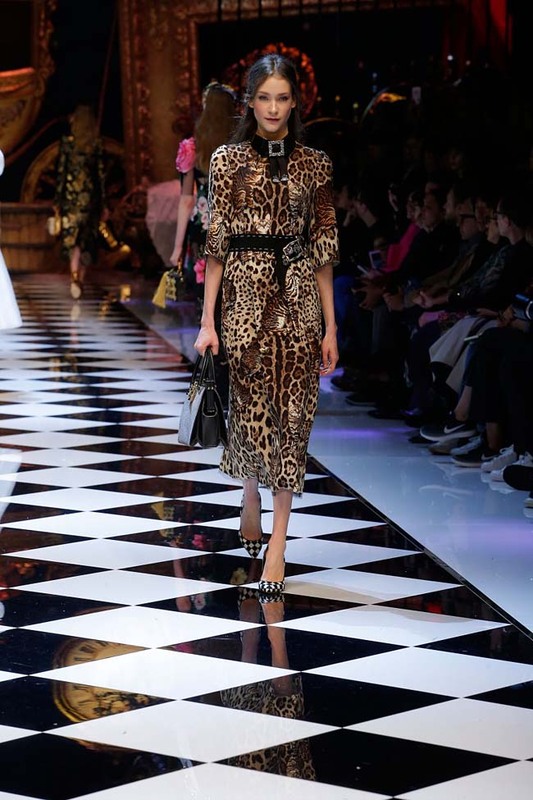 The collection had a certain 18th century royal Italian influence to it – with army-inspired red double-breasted jackets with hussar-frogging, Queen-like coats with large bows, chequered suits with satin lapels. 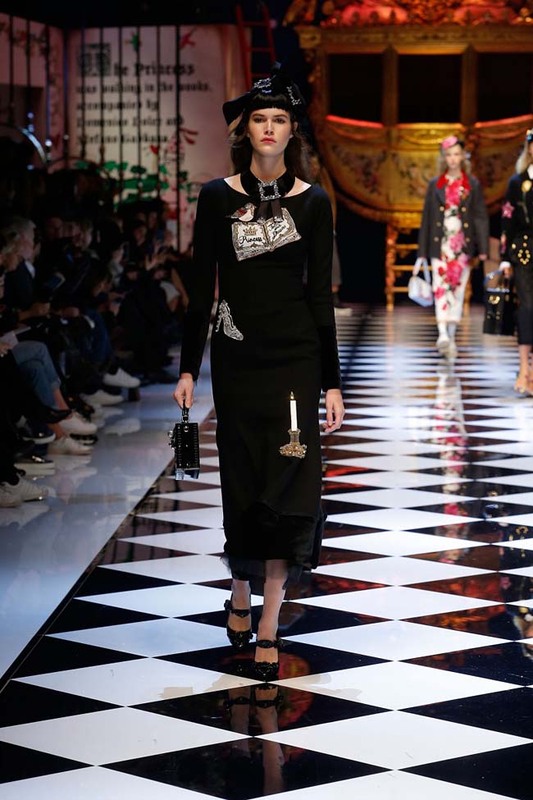 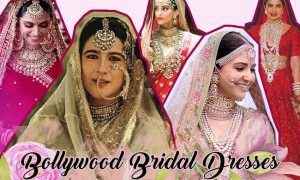 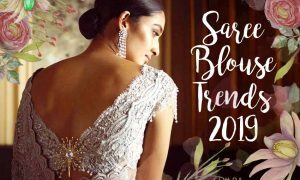 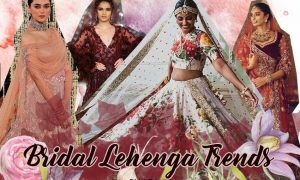 Other influences included ribbon-bow chokers, interior-motifs like a chandelier-shaped handbag, ornate mirror-frame applique or candle-holder embroidery. 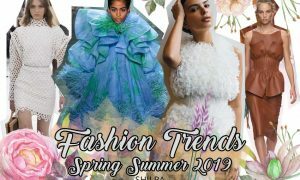 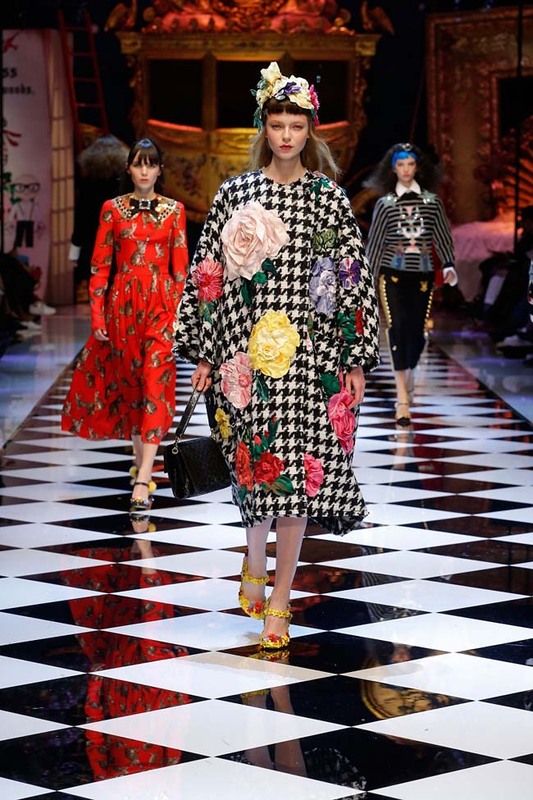 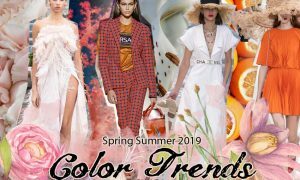 Appliqué certainly stole the show – from large roses to multi-colored flowers that covered entire surfaces, to crochet patchwork teddies to sequins. 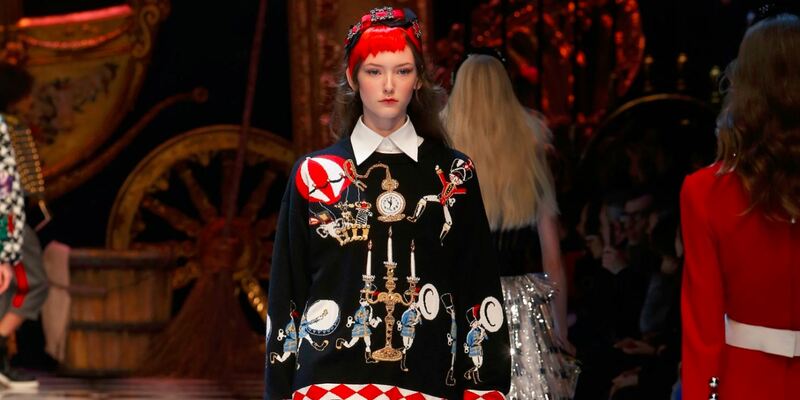 The other motifs were fairy-tale books, teapots, kittens, chandeliers, birds and army soldiers. 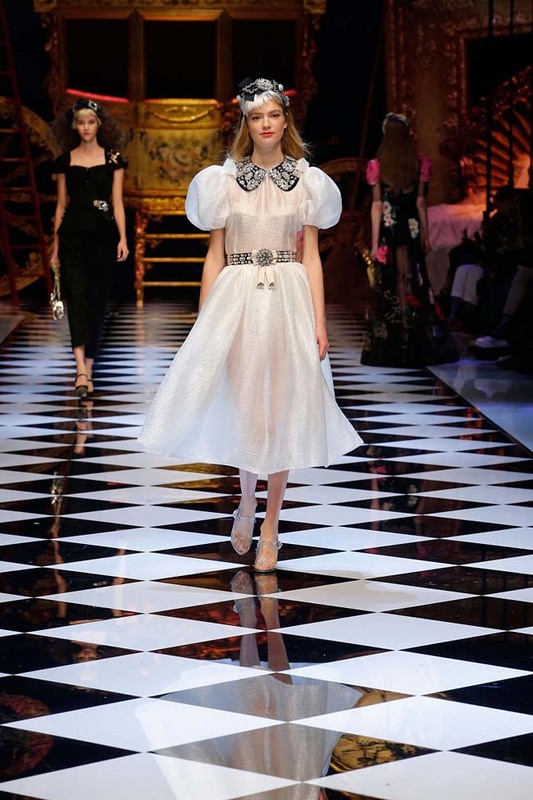 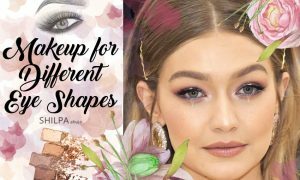 The collection was undoubtedly inspired, and the fantasy and modern princess-y theme certainly came through. 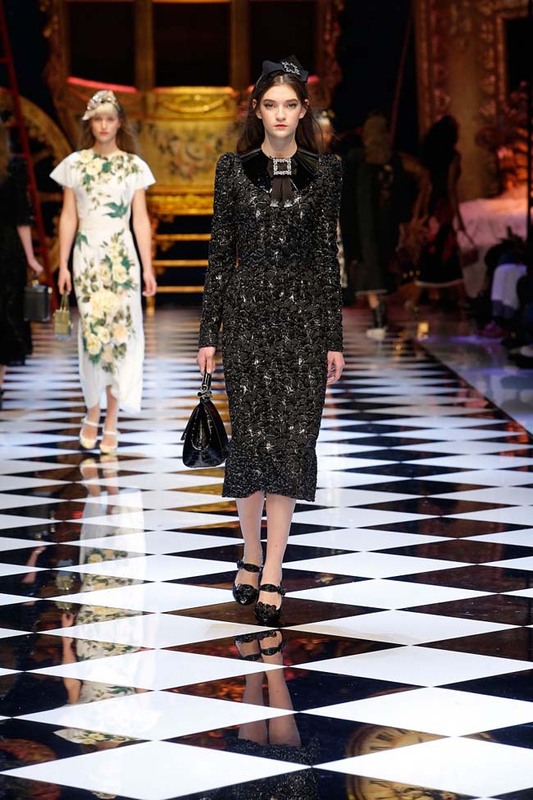 Two of my favorite looks were these – one explores a delicate sensuality and another the elegant yet traditional royal style.